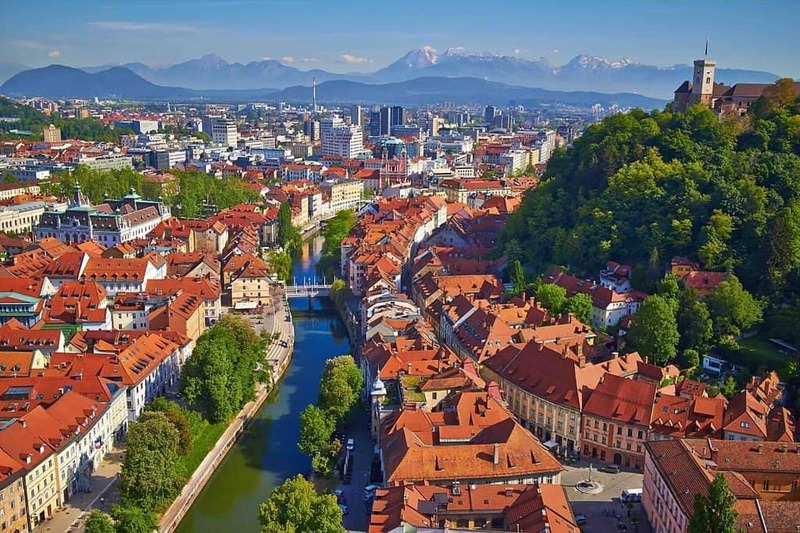 Ljubljana (pronounced as “Liubliana”) is one of the world’s top green and eco-friendly capitals. Friendly, safe, charming, cultured, tidy and clean. The capital of Slovenia has 300.000 inhabitants. Tiny in size and easily discovered by foot. Here we present the best 16 things to do in Ljubljana. Enjoy reading! Ljubljana offers plenty of different art galleries where everyone can find something of their interests. National Gallery is the main art museum in Slovenia that features the very best in Slovene art from the 13th century up to the first half of the 20th century. The most visited museum is the Museum of Illusions which will provide you, your family and friends full entertainment. With the help of some tricks, you will be learned about vision, perception, the human brain, and science which will help you understand why your eyes see things which your brain cannot understand. For those wanting to understand more about Slovenia, National Museum of Contemporary History is the right choice. The museum offers an overview of Slovenian history from the 19th through the 21st century. 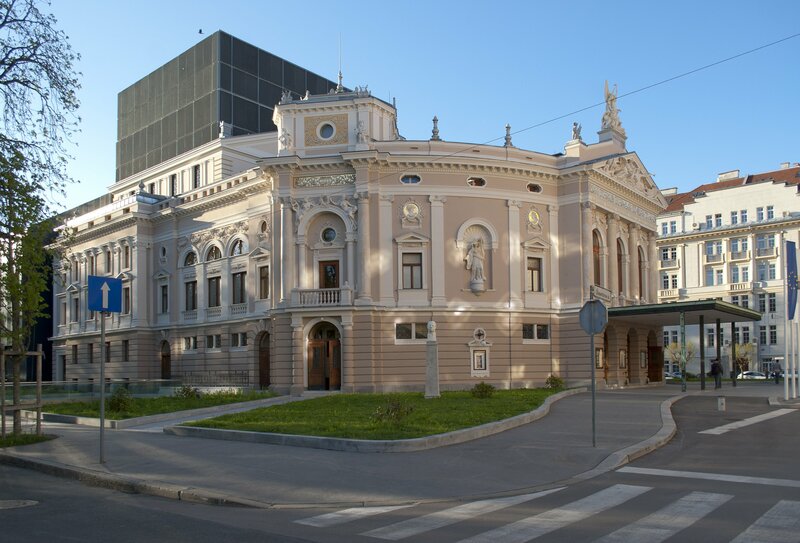 Visit Slovenian National Opera and Ballet Theatre which performs classical and modern operas, ballets and concert works. It is recommended to buy tickets in advance as it is many times full. The building is beautiful and small, well worth seeing, located near Tivoli Park. Do not miss CityPark, Slovenia’s largest business, shopping, entertainment, recreation and cultural centers. There are over 450 stores, bars, restaurants, the main shopping mall CityPark, a market, 3 D cinema, a waterpark with sauna, a hotel, an entertainment center with a casino, bowling and two office buildings. Take a morning or afternoon stroll or have a picnic with your friends in Tivoli Park, the largest and stunning park in the city. There you will feel fresh air, surrounded by greenery, enjoy the smell of flowers and experience beautiful views. Perfect for zen time, to relax or do some yoga. 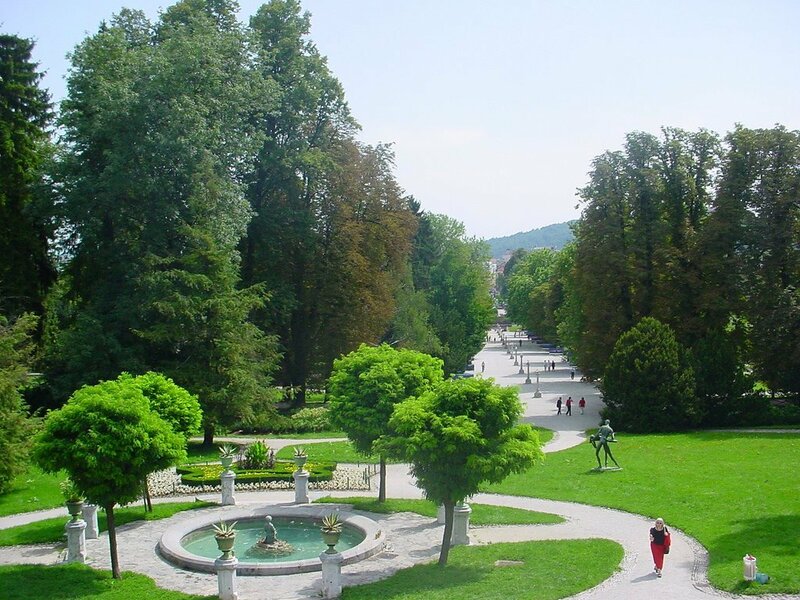 The central part of Tivoli Park – Jakopič Promenade is a lovely and popular outdoor venue for various art exhibitions worth visiting. In the Park, there is Tivoli Castle, a mansion, where are held many events. 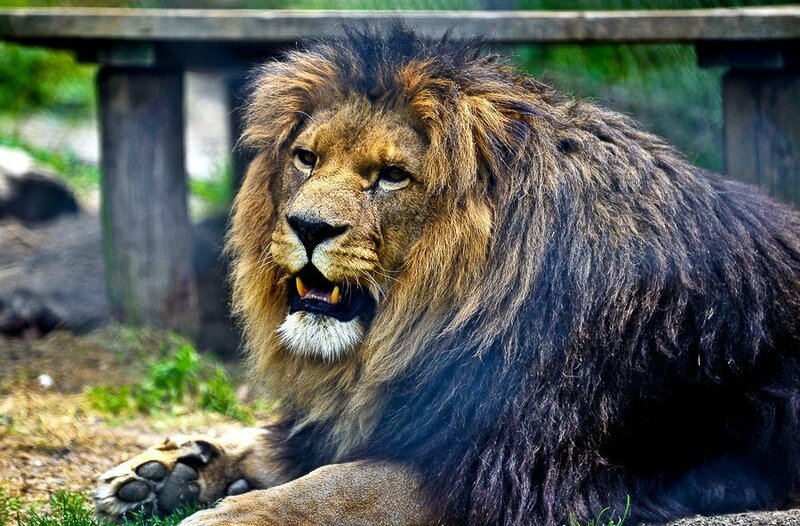 Your children will love the idea of visiting the Ljubljana ZOO, located within a natural forest on the slopes of Rožnik Hill, only a 20-minute walk from the center of the city. Children will take part in many different workshops, activities and be in close contact with animals or simply have a guided tour of the ZOO. 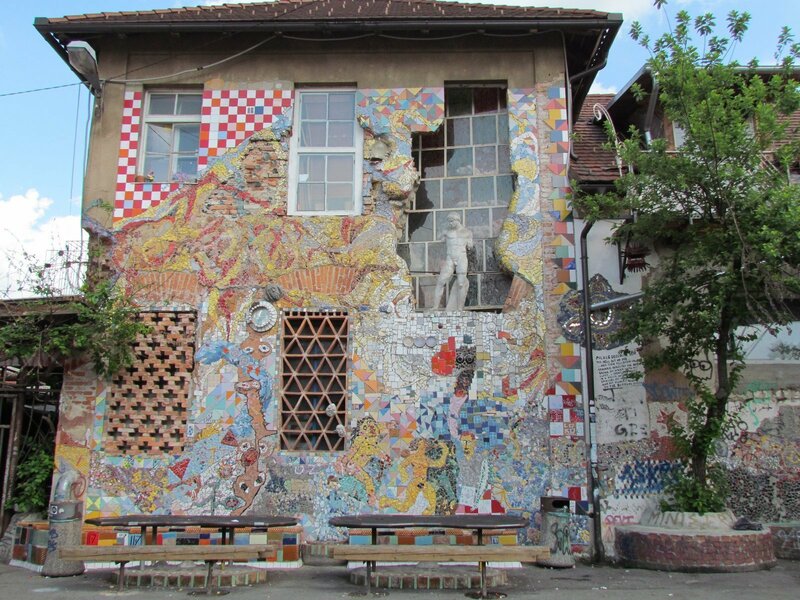 Alternative culture, alternative style and art you will find in Metelkova city, located in the center of Ljubljana and is also one of the best-known attractions Ljubljana. It’s a place you can’t find easily everywhere and is worth a visit. This is also a place where various artists are working and living here. Apart from art, graffiti, metal work, mosaic art and ceramic sculptures there are clubs, bars and art galleries. 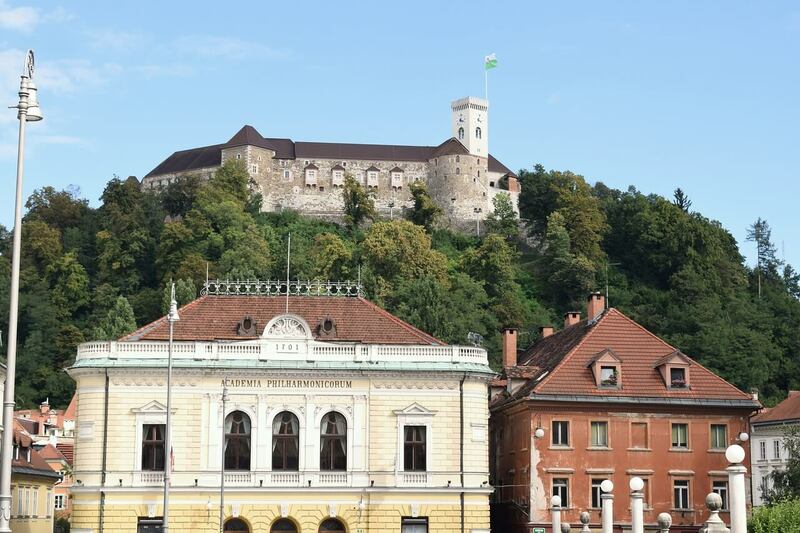 Ljubljana Castle, from the 11th century, is nestled on a small hill in the center of the city. You can reach the Castle from different paths, walking up the hill from the Old Town or take the funicular (4 € return trip) from Krekov trg. Today the Castle hosts a number of cultural events, concerts, in summer outdoor cinema, weddings and exhibitions throughout of the year. The castle offers various guided tours and some sections that are free of charge. There are art galleries, as well as a bar, restaurant and castle souvenir shop. Not only that, the location of the Castle will reward you with a spectacular view of the city and beyond. 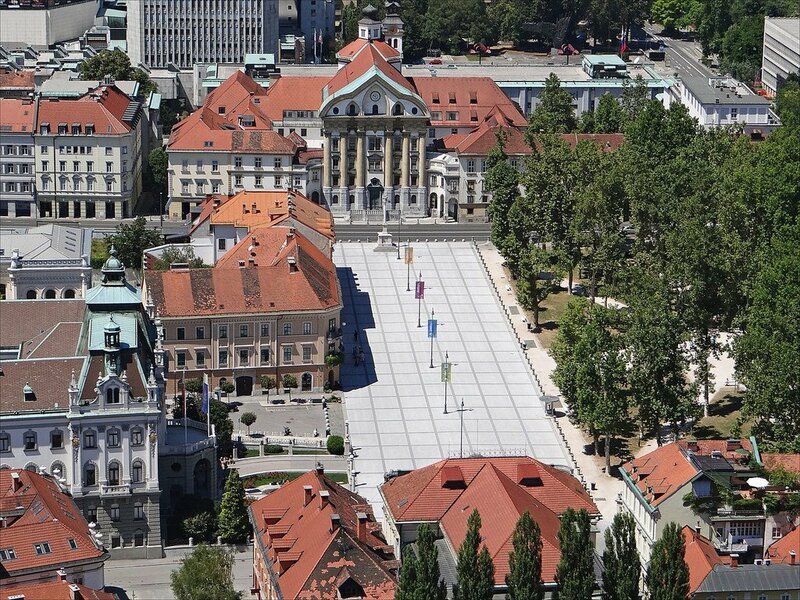 Some important buildings face the square: Baroque Ursuline Church of the Holy Trinity, the Slovenian Philharmonic building, and the rectorate of the University of Ljubljana. There is also a marvelous view of the Ljubljana Castle on the hill. Right next to the square there is Zvezda park with tall trees and maintained grass where you can have a short rest from the busy city center or just observe the vibe of the city. During summer there are many performances, concerts, etc. 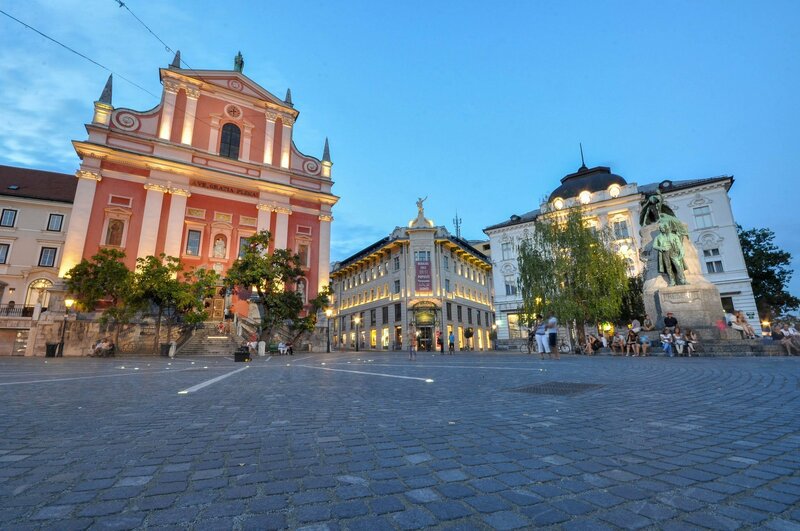 For all market lovers, Ljubljana features the Central Market, which is an open-air market, situated between the two squares, the Vodnikov trg and Pogačarnev trg and other small shops along the river Ljubljanica. 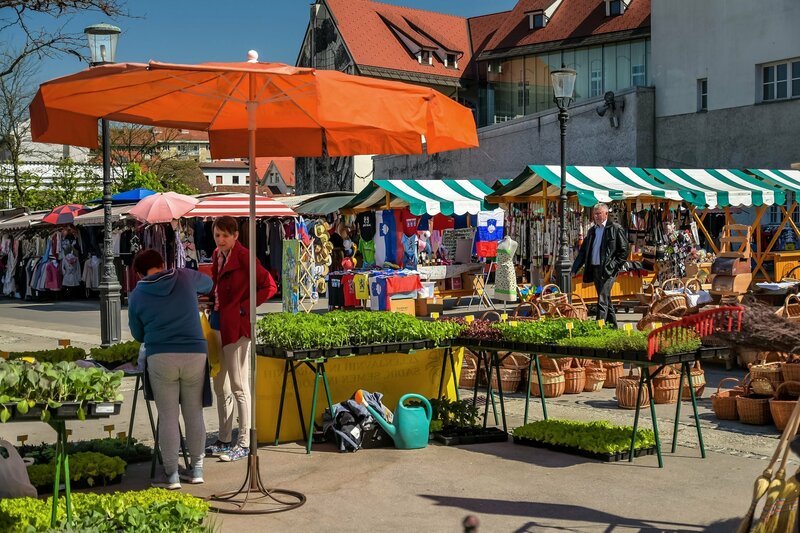 The market offers local Slovenian fruits and vegetables, tropical fruits, flowers and meat products. There you can find also organic foods grown by local farmers. Right next to the outdoor market there is a covered market where you can find dried fruit, bread and pastries. 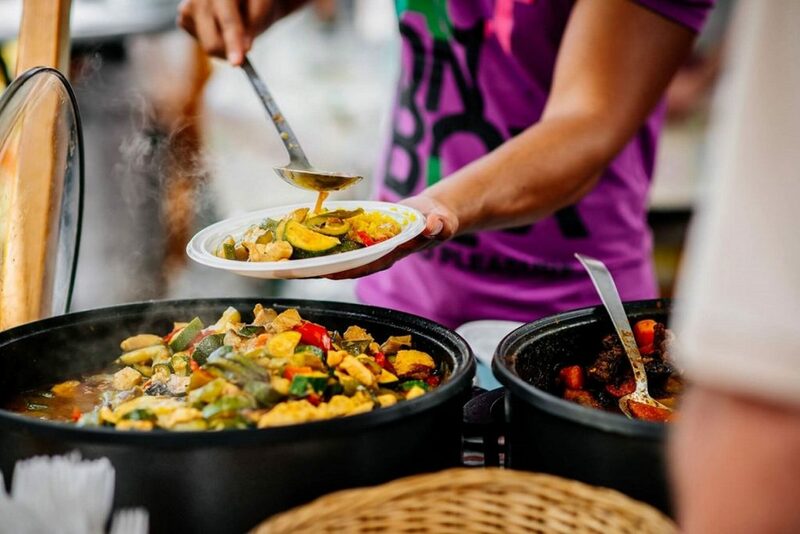 During the year the market hosts various culinary events – one of which the most popular is open-air food market “The Open Kitchen” (Odprta kuhna). Being in the central market is a great opportunity to try traditional Slovenian food. Do you want to enjoy some of the most beautiful 360 views of the city from above? Then you need to visit Skyscraper (or “Nebotičnik” in Slovenian). Wooden spiral stairs will lead you to the top of the building, on the 11th floor where you can pamper yourself with a tasty coffee and a dessert in the bar with nice ambiance. And if you visit in the late of the afternoon, you will experience romantic sunset view. There are various shops, business offices and on the 6th to 9th floors residential flats. 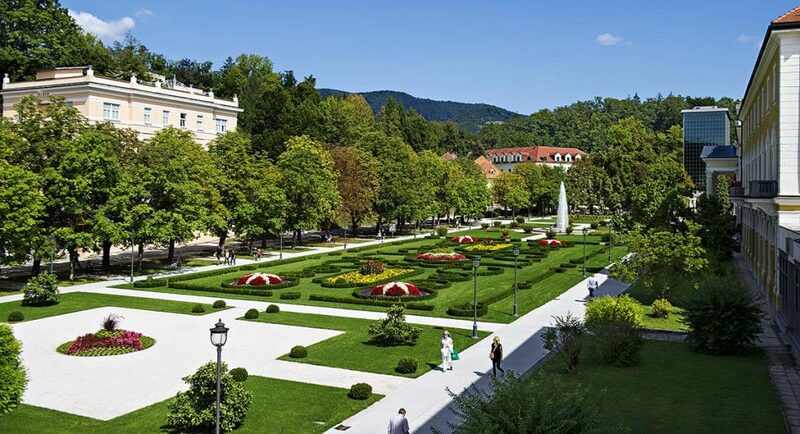 Prešeren Square is a perfect point where you should start sightseeing of the city. Prešeren Square is the central square of the city and a meeting place and a site for concerts and different events. At the eastern side of the square, there is a stature of France Prešeren (after whom the square is named), the biggest and most important Slovene poet, with a muse of poetry, his great love above his statue, Julija Primic. From the square, you can walk down the Ljubljanica river or walk up. Plenty of different cafes and restaurants are downriver with beautiful views. This is a busy spot of Ljubljana with street musicians and other entertainers. Nearby are three bridges forming the Triple bridge (or “Tromostovje” in Slovene) crossing Ljubljanica river. In the background of the square, there is a Franciscan church of the Annunciation. Nightlife in Ljubljana is diverse with plenty of bars, clubs and pubs. The city by night is also much different in summer than in winter. In summer you will seat outside one of the bars and watch people passing you by. For all metal and rock music lovers, Orto bar is a great choice. 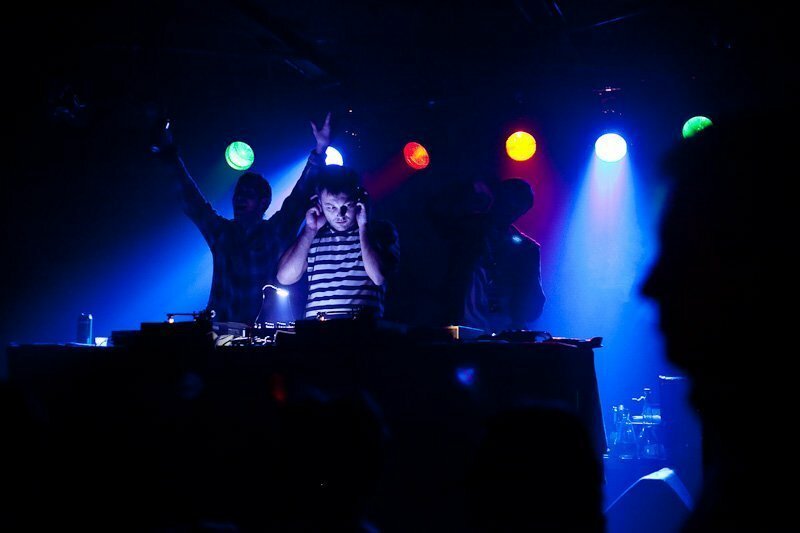 It is the biggest and most well-known rock bar with three floors, crazy parties, and best DJ programmes. 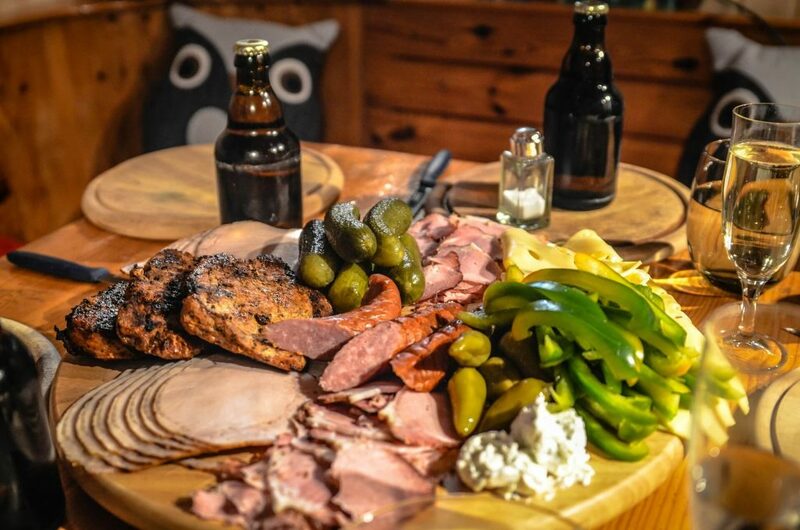 Cvetličarna is another alternative where you can enjoy with your friends on Friday or Saturday night. It hosts not only events and concerts but also stands up comedy shows. If you are looking more classic club, then Bachus is a good choice. This is a wine bar by day and a club by night set on three floors. 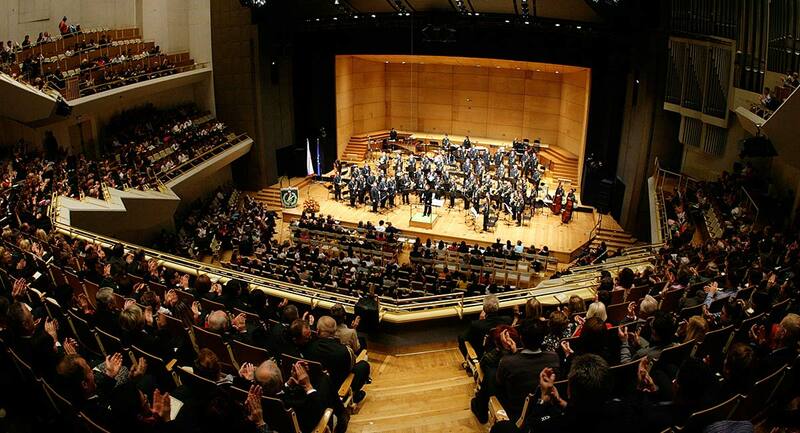 Cankarjev dom (named after the Slovene writer Ivan Cankar) is the largest cultural and congress center in Ljubljana that hosts events of all kinds, exhibitions, dance shows, concerts, etc. Definitely, you will find something of your interest. 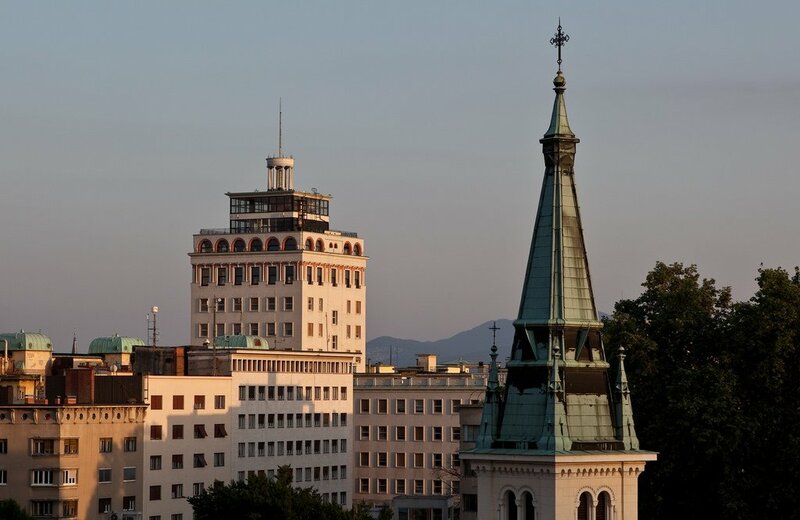 In the center of Ljubljana, you will find one of the most important national educational institutions of Slovenia, designed by famous architect Jože Plečnik. It has a rich collection of medieval manuscripts, incunabula and Renaissance prints. Unfortunately, tourists are not allowed to enter (open only to students of the university), but you can stop by and at least admire the exterior. 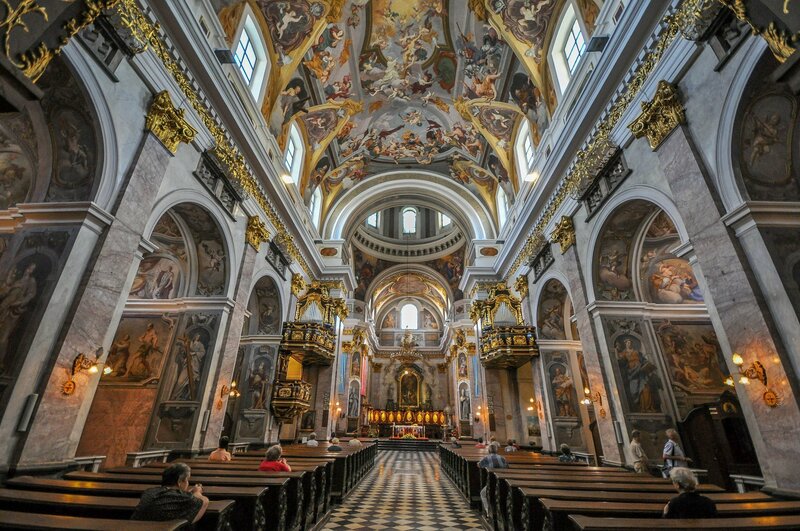 Located in the historic old city center and is the main church of the city from the early 18th century. The outside part is not impressive, but the interior is breathtaking, picturesque with the Baroque decor, exquisite frescos and bronze doors. So this was our selection of best things to do in Ljubljana. 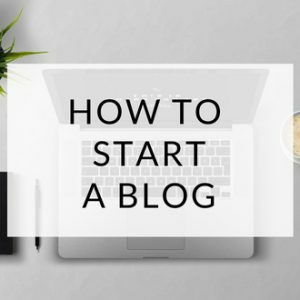 Now, what are you waiting for? Get yourself here, enjoy this wonderful capital of Slovenia and make your stay memorable. 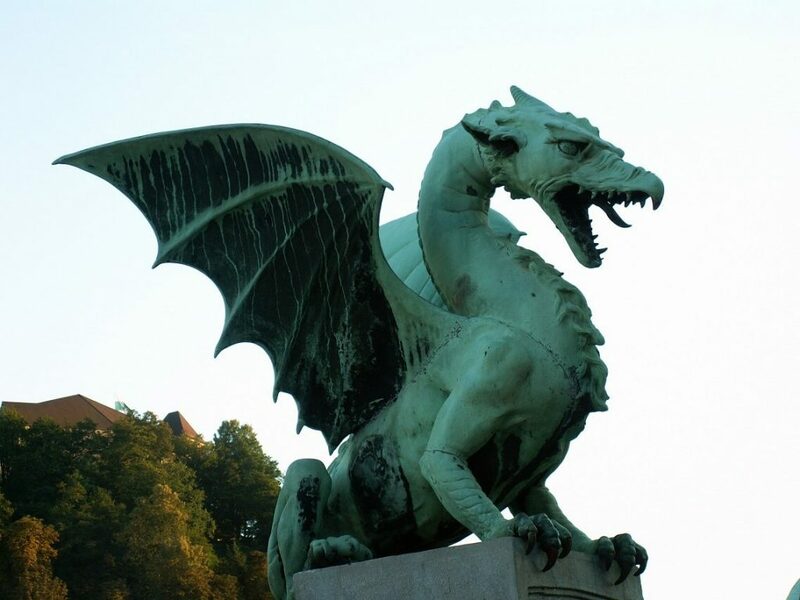 I can say for sure that Dragon’s bridge is one of Ljubljana’s most recognizable icons. The bridge, from the early 20th-century, crosses the Ljubljanica river to the Old Town of Ljubljana. It has four dragon statues, one at each of the corners. The truth is that traditional Slovenian food is quite unknown and that is also a reason why I’ve decided to present it in this post. 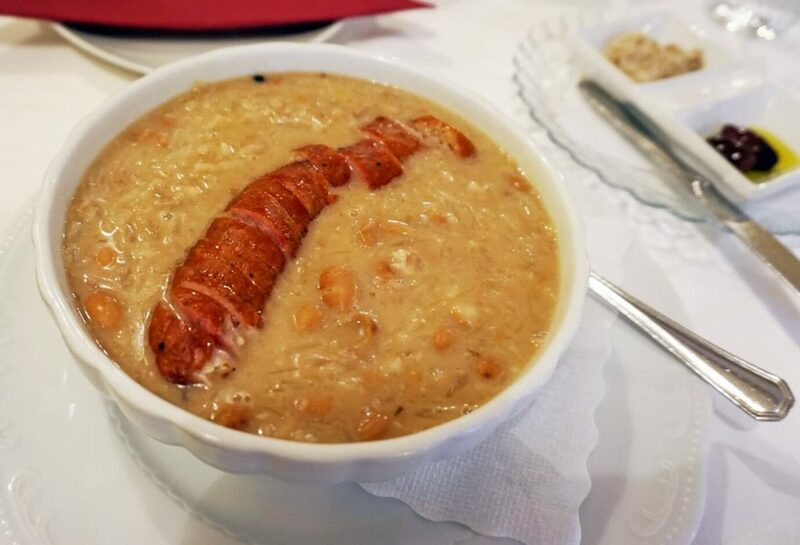 Via this guide to Slovenian gastronomy, I will help you get to know the rich culinary heritage and give you some ideas about what to eat in Slovenia or Ljubljana. It is so amazing that such a small country like Slovenia offers various food (over 170 distinguishable dishes) depending on climate, history, traditions, also villages and towns. Each region has its own specific culinary tradition rooting back to historic time. 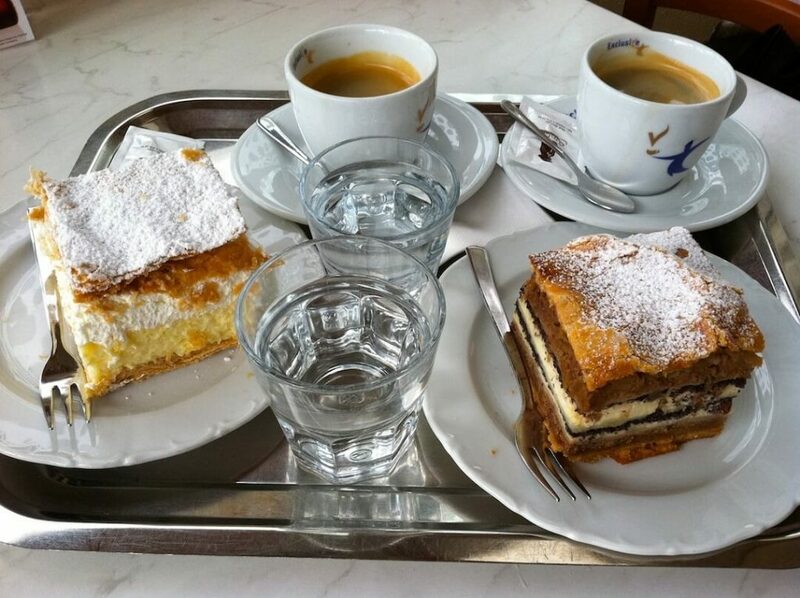 Additionally, Slovenian cuisine is under significant influence of the neighboring countries’ food from Austria, Balkan countries, Italy and Hungary. 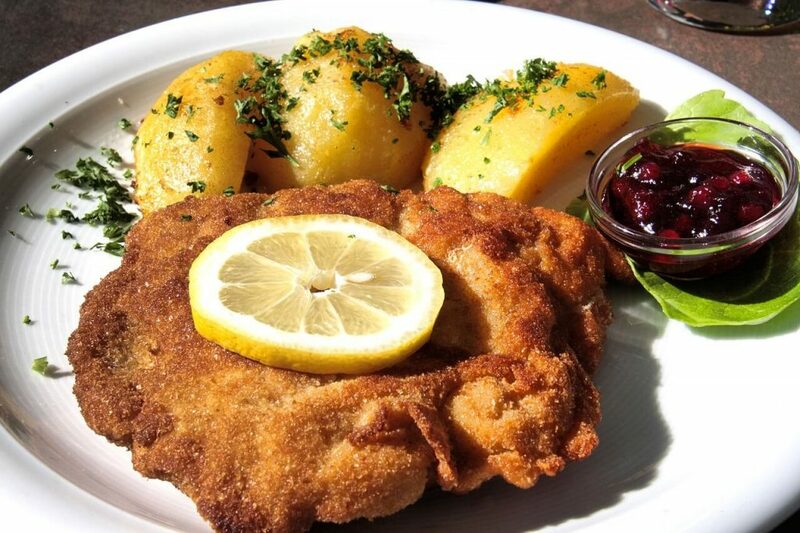 Austria cuisine: sausage (“klobasa“), Wiener Schnitzel (“dunajski zrezek“) and strudel (“štrudelj” – a pastry with a filling of apples/sour cherry/cabbage,…). 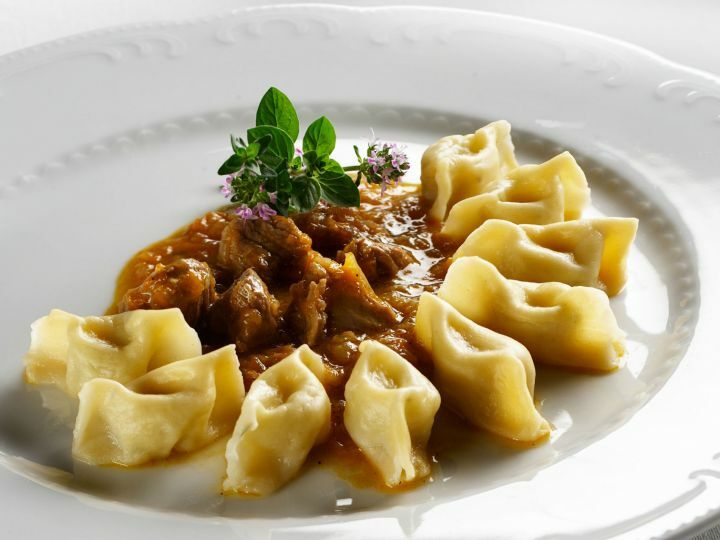 Italian cuisine: all kind of dishes made from pasta, gnocchi (small, and soft dough dumplings), pizza, rižota -risotto, žlikrofi (similar to ravioli – small cases of pasta filled with meat or cheese), minestrone (“mineštra” – a thick soup made with vegetables, also meat, sometimes with pasta or rice). Hungarian cuisine: goulash (“golaž” – a stew made with meat, onion and paprika), pancakes (filled with jam, nuts or chocolate). Balkan cuisine: burek (a pie made of beef/cottage cheese/spinach), čevapčiči (small grilled minced meat served with onions, flatbread and ajvar – red pepper spread). Some basics used in Slovenian gastronomy are dairy products, mushrooms, sausages, meat (mainly pork), seafood, incorporating seasonal fruits and vegetables, potatoes, beans, grapes, honey, herbs and olives. What is very common/appropriate to do here before starting your meal is “Dober tek” (“Bon appétit”), and the answer to that is “Hvala enako” (“Thank you, the same to you”), also “Na zdravje” (“Cheers”). Dishes can be sometimes expensive, but you have also an option for more economic cooked foods at local supermarkets. The old traditional Slovenian breakfast consists of fresh bread, a cup of milk, butter, honey an apples. This type of breakfast is not common now anymore. For breakfast, we eat homemade marmalade, also eggs, meat products, cheese, and cereals. We drink natural juice, milk, tea, coffee or cacao. Bread plays a special role is Slovenian cuisine. There is a wide variety of bread, made of grain wheat flour, rye, corn, buckwheat, spelt, oat and more. Moreover, many times it is added also various seeds, even onions, olives or walnuts. Traditionally, most Slovenian meals start with soup (all year round). 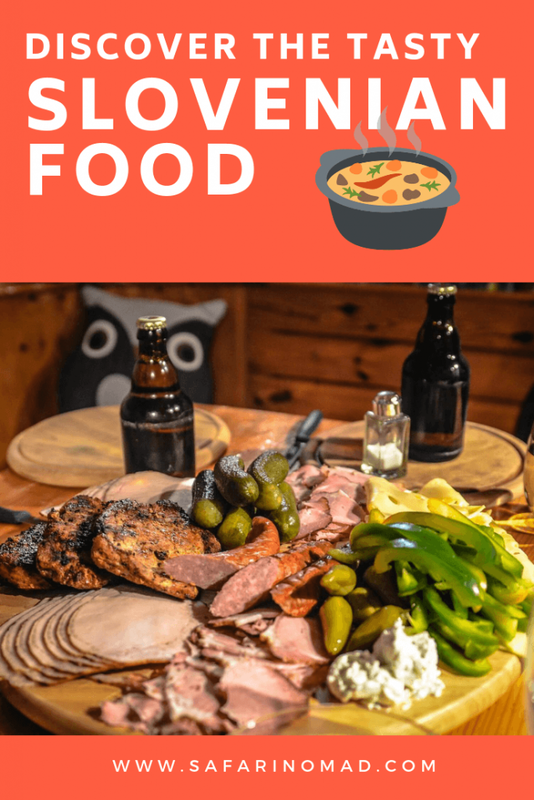 You can find an endless variety of soups – mushroom soup, chicken soup, barley soup, “jota” (soup with sauerkraut/turnip, beans, potatoes and smoked pork or sausage), bean soup, mix-vegetable soup but the most common is beef broth with noodles. What’s more, beef soup is also a common starter on Sundays in many Slovenian families. “Mineštra” (minestrone) or stew are also very typical and a favorite Slovenian dish, many times cooked with pork bones, ribs, sausage or another type of meat. The main dish often includes meat. A favorite side dish is roasted potatoes (“pražen krompir“), but also rice or “štruklji” (boiled/baked dough rolls containing various fillings). The interesting thing about “štruklji” is that they can be served as a dessert as well. A salad is also an important part of lunch with pumpkin seed or olive oil as a dressing. Bread is often served on the side. Potica – a national dessert, yeast-dough roll cake with a variety of filling options (tarragon, walnut, crackling and poppy seeds). We usually eat potica for Christmas, Easter or other holidays. 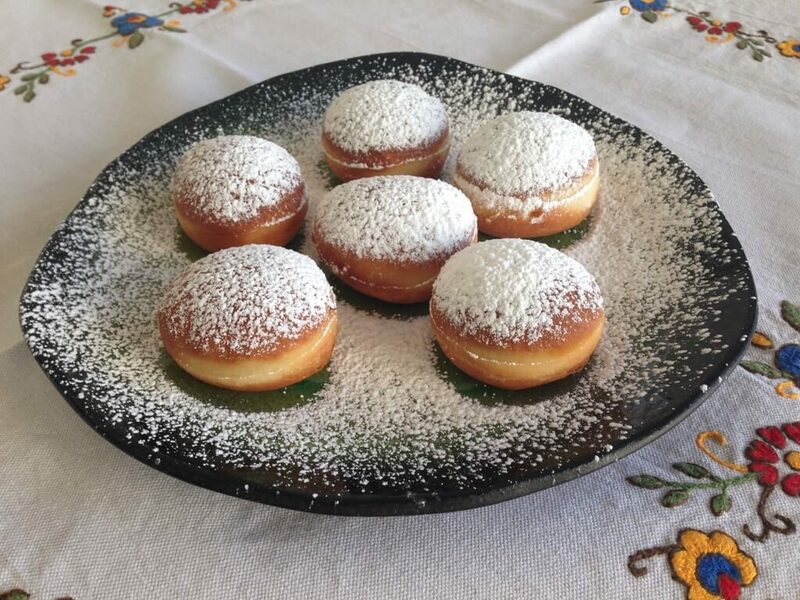 Krof or slovenian fried dough is fluffy round fried dough bun filled with apricot jam, traditionally made for carnival time. Seafood is mainly popular along the coast of Slovenia. Pumpkin seed oil is so delicious and healthy. It is mostly used as a salad dressing. 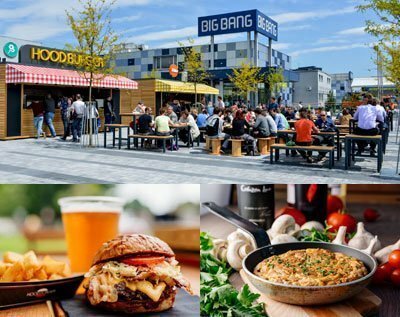 Many Slovenian towns and cities host culinary and social events, but the last couple of years is popular a unique culinary street food event called “Odprta Kuhna” (the Open Kitchen). The feature of this event is you can experience freshly cooked food prepared by Slovenian chefs right in front of you. Apart from delicious food, it’s a place of good live music and entertainment. 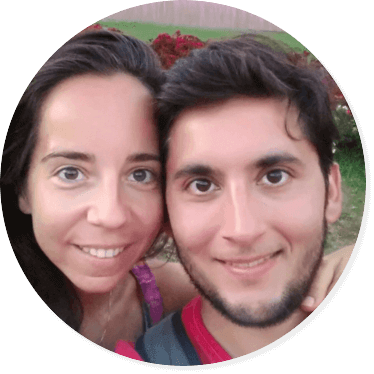 My husband and I love this event and always find something for our taste – from Slovenian dishes to international and exotic dishes. I personally love a various choice of food there, but mostly vegan. Yummy! Among friends, it is common to hear “gremo na pijačo” (let’s go for a drink). Many times you can find on Slovenian tables local mineral water but without a good wine is not a good meal. Very common is “špricer“, half wine and half mineral water. We have three wine-growing regions in Slovenia and are very proud of high-quality wines (sorry, I cannot recommend any since I don’t drink alcohol :)). 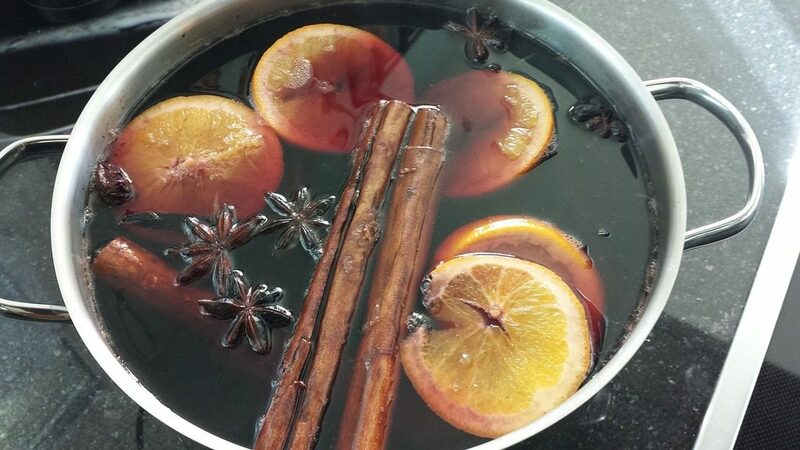 In winter Slovenians like drinking “kuhano vino” or “mulled wine”, traditionally made of red or white wine with spices. There is also a Slovene brandy called “žganje” or “šnopc“. After lunch or in the afternoon with our friends or family, we usually enjoy drinking Turkish coffee. Coffee with milk or whipped cream is also commonly available. As you could assume so far, Slovenian cuisine tends to be meat-dominated (or at least using meat products ingredients) but it does not mean that all vegans out there “draw the short straw”. The same like there’s a tendency of vegan option in the world, I believe that Slovenia is progressing when it comes to offering non-meat dishes as well. There are some restaurants, cafe bars or at least menus that offer vegan food in Ljubljana. Good news is that even some traditional Slovenian food and desserts are now available in veganized version. Hooray! 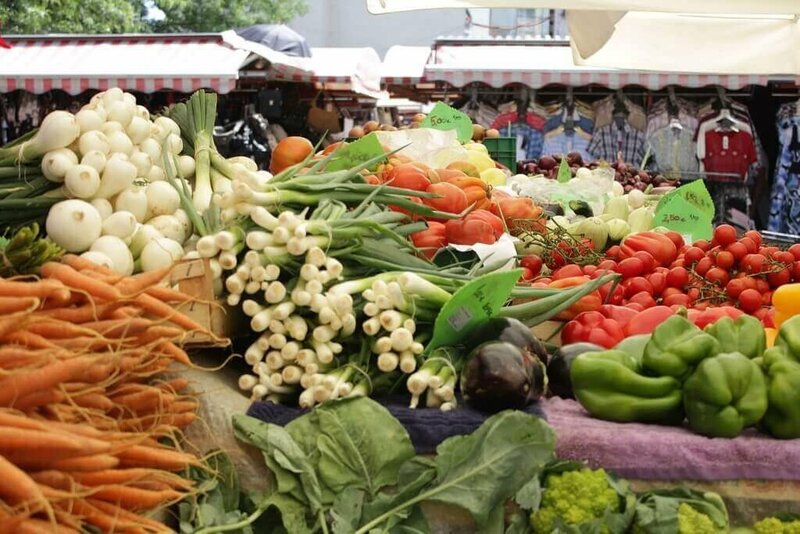 What’s more, many cities in Slovenia have markets where you can find a good selection of local, fresh and good quality fruits and vegetables. I like the colorful open-air central market in Ljubljana that is a must to visit. This place offers mostly organic vegetables, fruits, herbs, and some other products. Soup is the most popular starter (on Sundays is a must). We eat the main dish at the same time as the salad. We don’t have typical food for dinner. Usually, dinner is smaller than lunch (leftover from lunch, yogurt, cheese and salami with bread,…). You can see that our dishes are influenced by many cultures and are all with rich taste. When you are over here, I wish you can enjoy many of these delicious Slovenian plates. 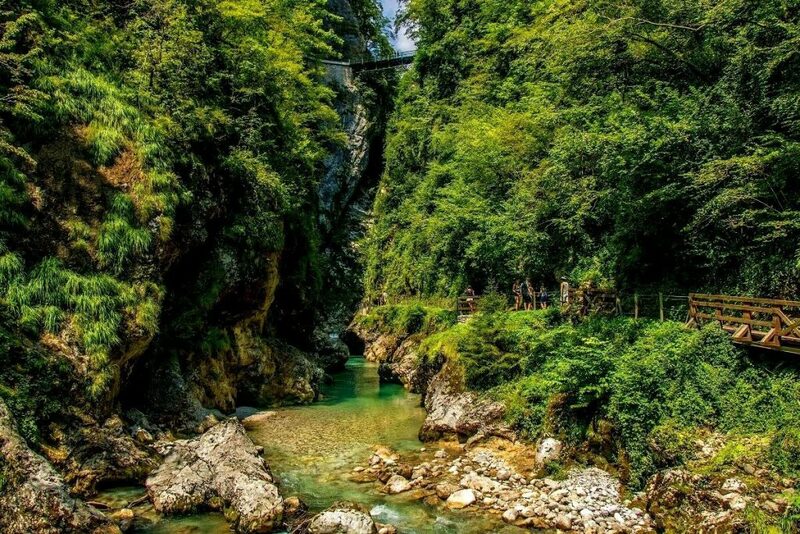 The Tolmin Gorge is just one of the many gorgeous places to visit in Slovenia. 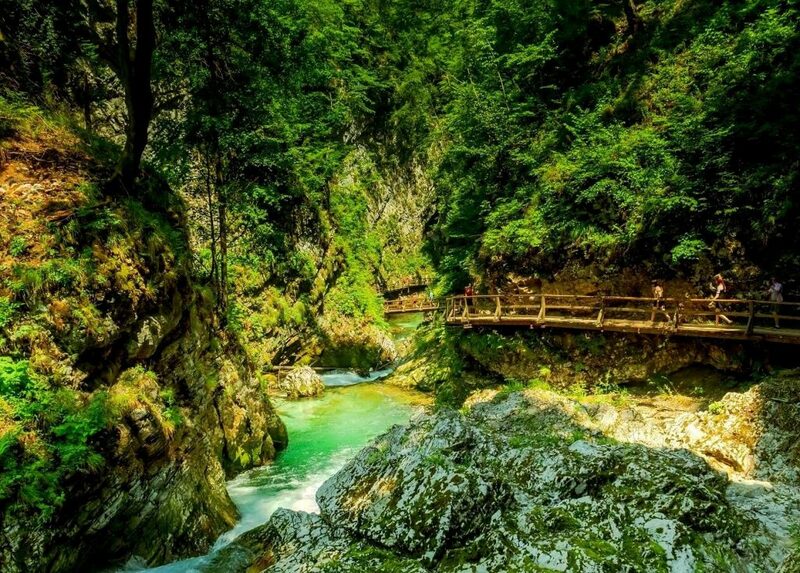 Similar experience to Vintgar Gorge, this Gorge is a stunning nature sight you can admire by following the tourist trail. 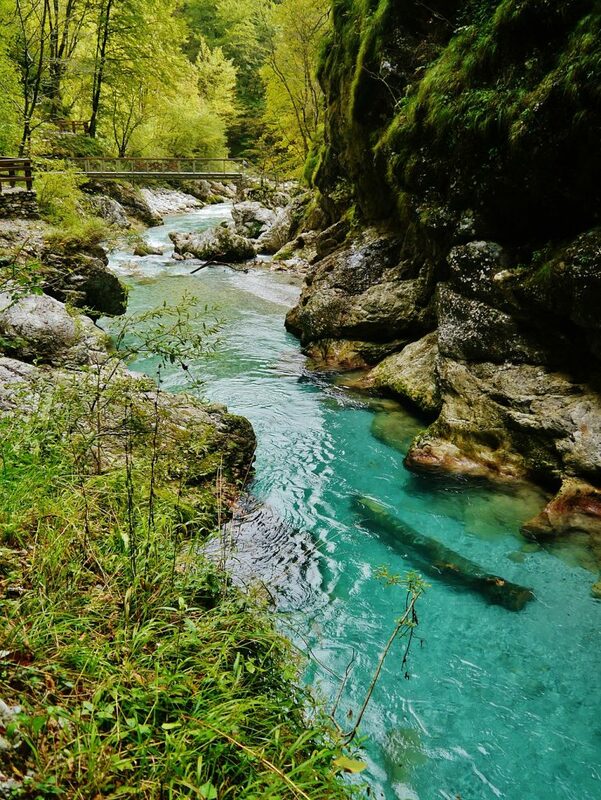 Beauty to the eyes is to see the crystal clear turquoise water of Tolminka river and its surrounding. If you want to connect with nature here you will feel blessed. The best time to visit: spring, autumn, early mornings in the summertime. The simplest way to get there is by car. Follow the direction Zatolmin, then signpost Zadlaz – Čadrg and very soon you come to a large parking lot, next to the entrance where you can park. Parking is free. 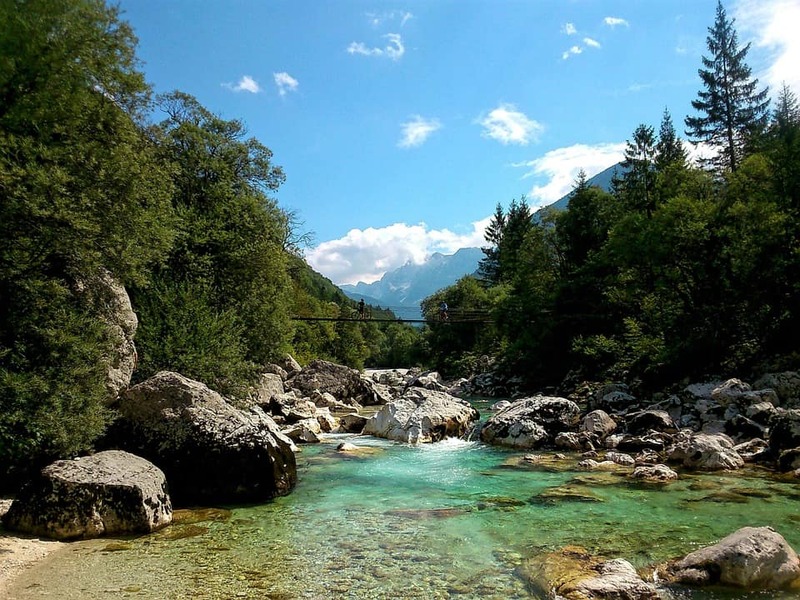 You can come here on foot from Tolmin as well – by following Tolminka stream. The distance from Tolmin is only 2 km (1,24 miles). You can also travel from Ljubljana to Tolmin by bus. 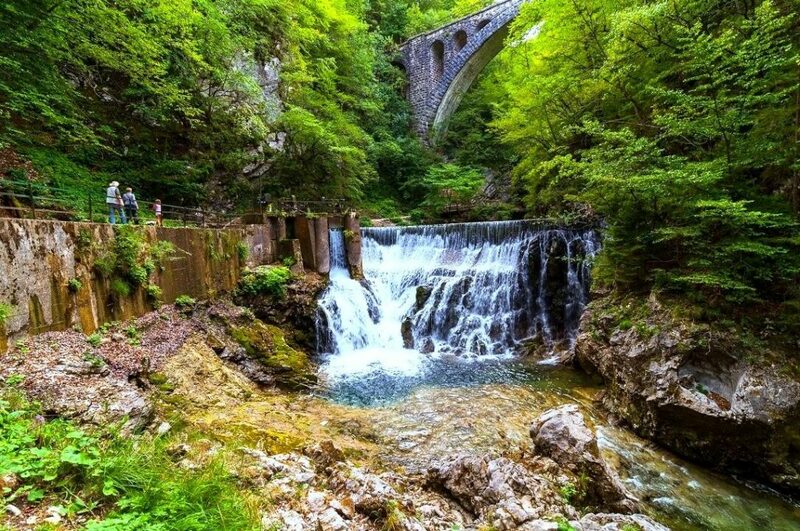 There is also a shuttle bus connecting Tolmin with the Gorge (an in the opposite direction) but is available in peak season (July and August). This minibus that fits up to 2o persons operates every full hour, between 10:00 a.m. and 4 p.m. from the big parking place next to the Brajda sports park in Tolmin. 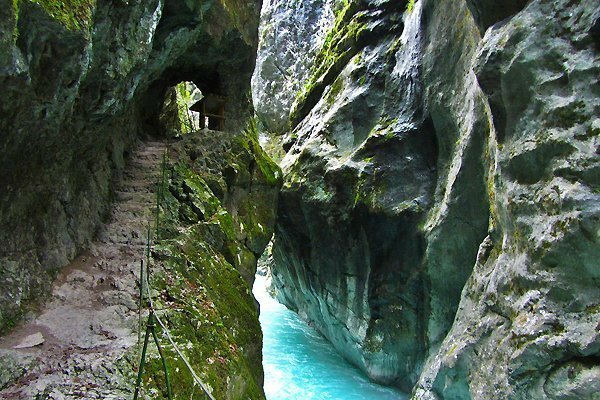 The Gorge, known as Tolminska korita in Slovene is a beautiful gorge and one of the most popular natural attraction in Soča Valley area. 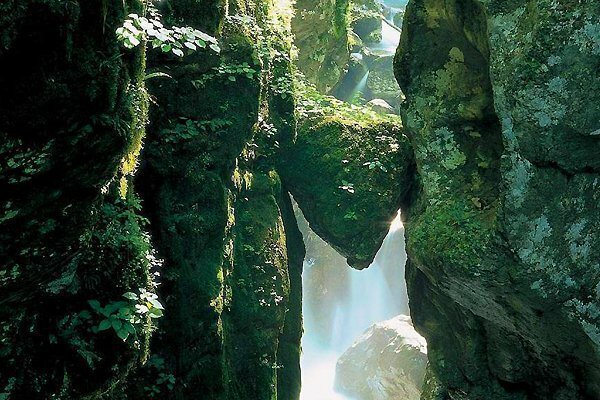 This gorge was shaped by two rivers, the Tolminka river and the Zadlaščica River. The Gorge’s trail is not long but enough to get to know some amazing spots along the way. It offers numerous hiking opportunities and dramatic views down to the turquoise waters, streams, natural pools, canyons, cascades and the gorge itself. You will walk on a small well maintained path next to the high rocky walls. The water is crystal clear, cold with stunning turquoise color. This place is unique and deserves your attention just by admiring its peacefulness, listening to the sound of the water, enjoying the natural beauty and breathing pure air. 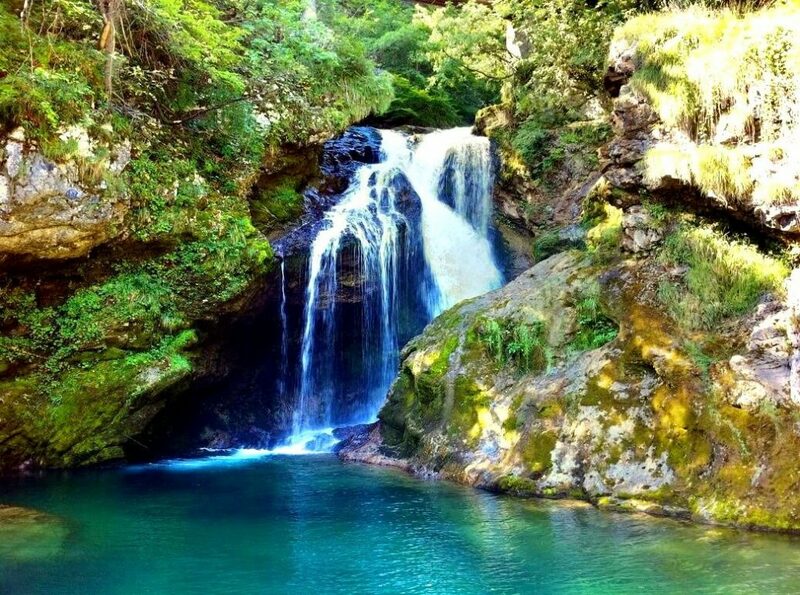 This is also a perfect spot for hikers, bikers, rafters and all nature lovers. Do not forget to bring your camera with you. The thermal spring and the narrow gorge. After walking through woods you arrive at the confluence of the Tolminka and Zadlaščica rivers. 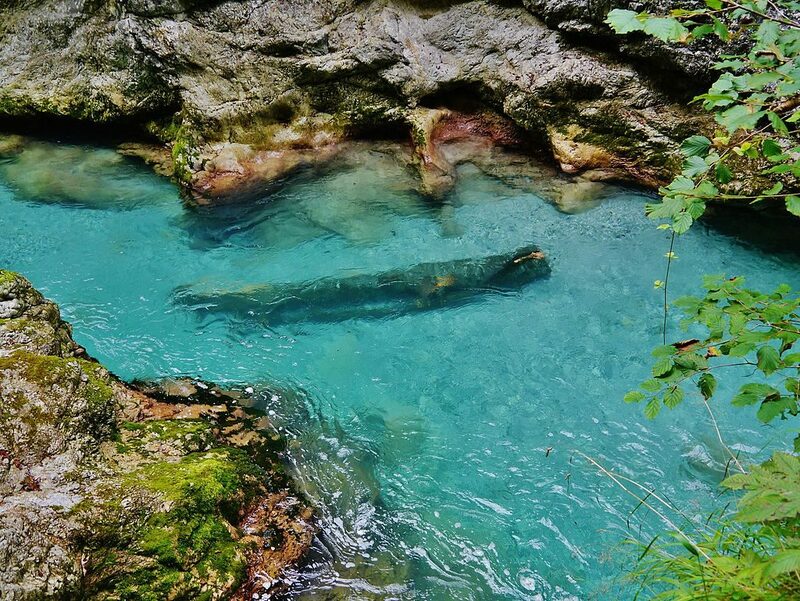 This is the lowest point of Triglav National Park, the only confluence in the water channel in the Slovenia area. During summer this is also a favorite swimming spot and to cool off when the temperature is high. 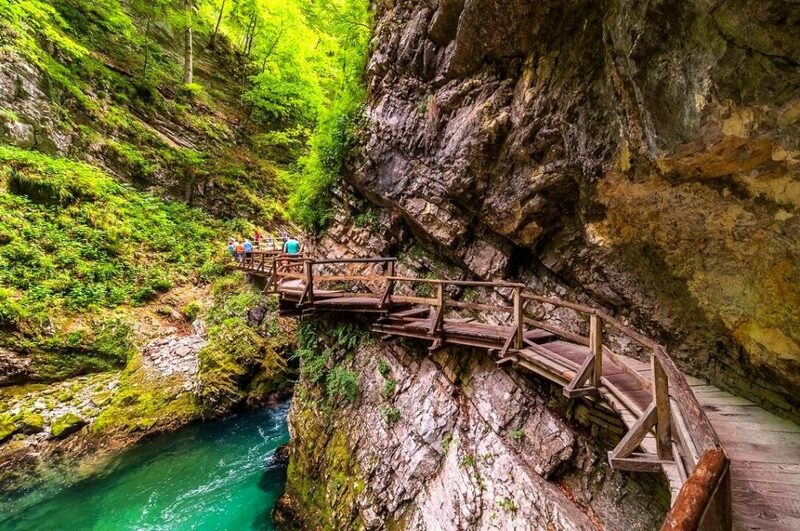 After crossing the small bridge, walk on the path along the crystal clear Tolminka river, where you are surrounded by 60-meter walls. Walking through the dark tunnels lead you to the narrow gorge and at the bottom of the path, it emerges a spring of thermal water with a temperature of 20°C (68°F). To reach Bear’s Head, you will need to go back the same way to the small bridge and continue on the left bank to the confluence of both streams. Start following the Zadlaščica stream which takes you to a giant triangular rock covered with moss, called Medvedova glava (Bear’s head). It is stuck inside the walls of the canyon. You are going to have an awesome panoramic view over the canyon and extremely lush vegetation. This is also a popular spot among photographers. Take the trail uphill toward Dante’s cave where it is believed Italian poet Dante Alighieri got the inspiration for his Divine Comedy. 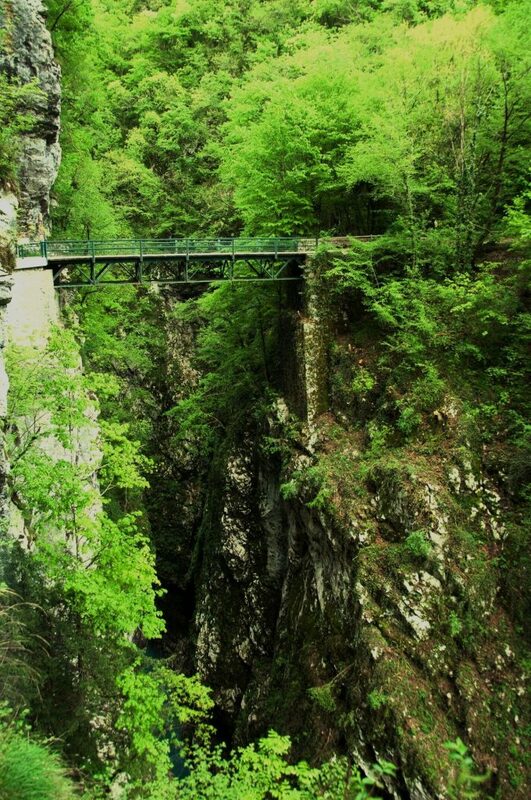 The Devil’s Bridge is 60 m high above the Tolminka river and Tolmin Gorge. It offers a wonderful view of the river below. From here you can walk back to the parking lot. Comfortable walking/hiking shoes are very important to wear for this trail. Take into account that some part of the path can be slippery when wet. Also, take some rain jacket if needed. 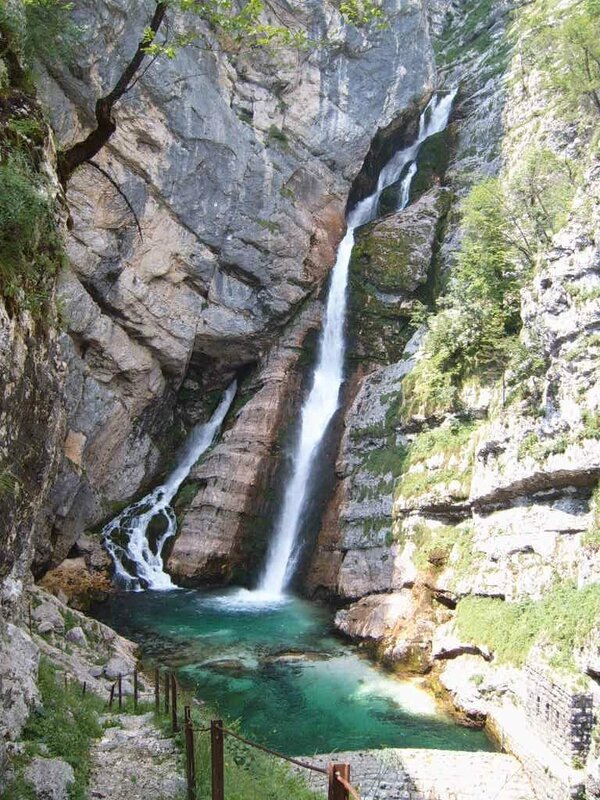 I invite you to visit this scenic place and I assure you will get amazed by this fantastic place inside Triglav National Park. The Slovenian Riviera and its beaches are many times underrated or unnoticed since it runs only 46.6 kilometers (26 miles) along the Adriatic Sea and is flanked by Italy and Croatia. The good point is that the Slovenian coast can be reached from the capital Ljubljana in less than an hour. 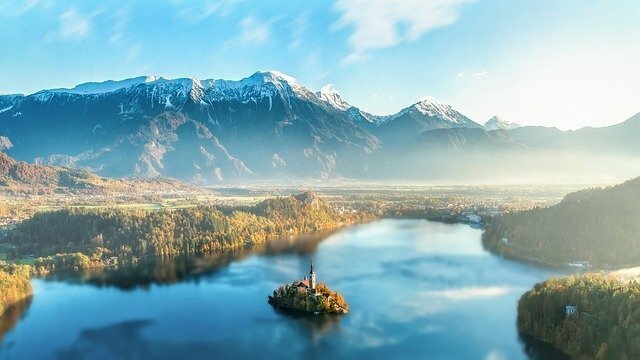 My country – Slovenia is mostly known as a green destination, an alpine paradise and a mountain getaway with a popular destination of Lake Bled with its fairy-tale castle but less known for its coast. As you will see in the following description, Slovenia isn’t really a beach destination with long sandy beaches yet it’s picturesque, charming and culturally rich with ancient Mediterranean towns and tiny streets. 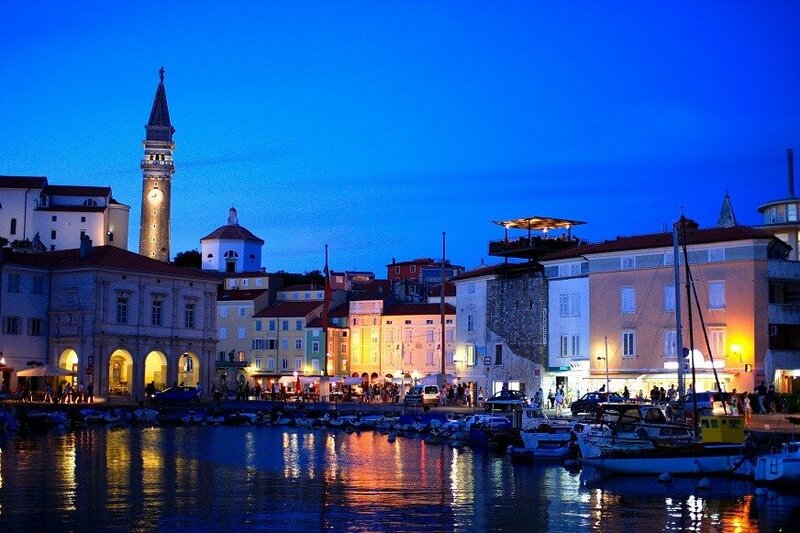 Slovenian Istria region is a land of attractions from the Roman, Medieval and Venetian era. There you cannot find palm trees yet lush greenery, protecting you from the sun. 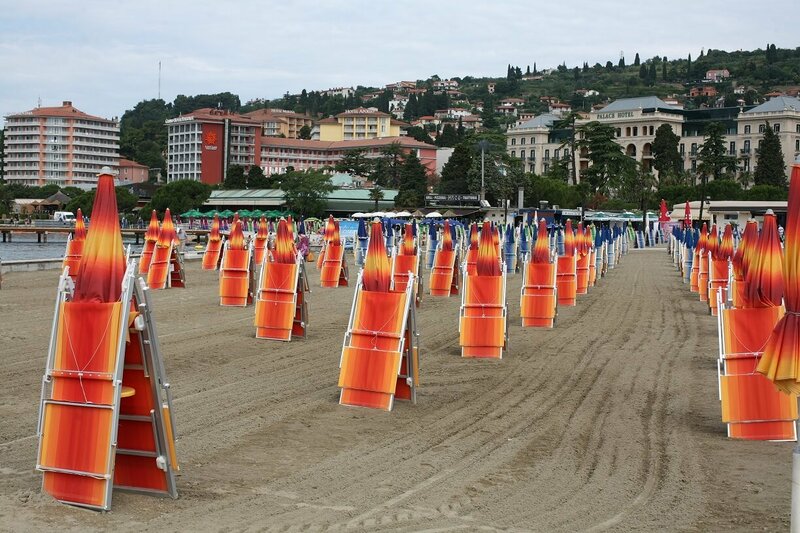 Portorož is the biggest, most touristic and high-end summer resort on the Slovenian coast. It is also the most expensive from all of the places on the coast. This is the place for you if you want to enjoy the fancy things, like wellness services (also therapeutic treatments based on the mud and brine from Sečovlje Salina salt pans), modern seaside hotels and resorts, a marina, trendy clubs, a wide selection of restaurants (Mediterranean dishes with strong Italian influence), shops and casinos along the waterfront. There’s also a small international airport offering charter flights. It is the only place on the Slovenian coast that offers parts of sandy beaches, but also concrete and grass. The most common and visited beach is the public beach (with wooden piers), which can get very crowded in summer and on weekends. 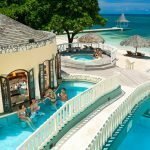 Apart from the public beach, there are also private beaches associated with luxury hotels, including Meduza beach of Life Class Hotels, Beach of St. Bernardin managed by the Bernardin resort. For these reasons, Portorož is the most popular beach in Slovenia. Just next to the border with Italy is situated Ankaran, boasts a charming area of greenery with pine trees, small hills, vineyards, and olive trees. Today there is well known Cape Debeli Rtič, where children and the youth have a summer retreat. 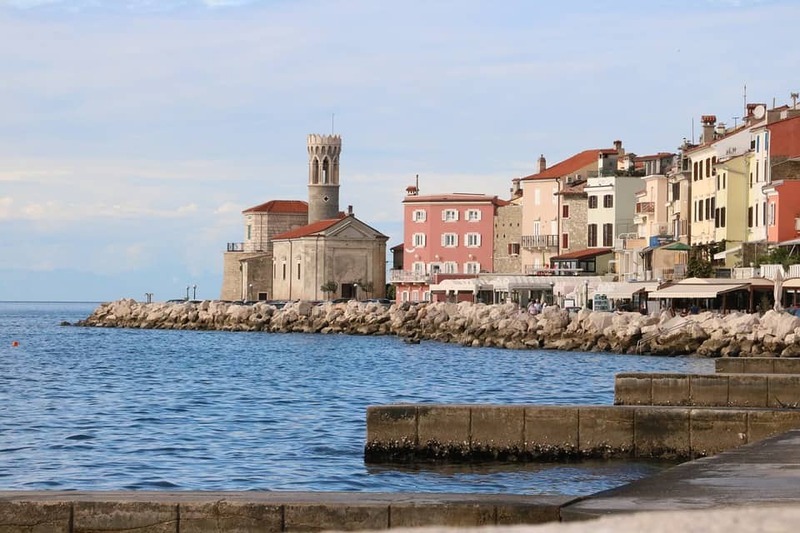 Ankaran features one of the biggest auto camp in Slovenia, swimming pools, sports fields, a seashell cemetery and about kilometer long beach (to locals known as San Nicolò) which ends with a wooden pier. The beaches in Ankaran are less crowded, so you will have more privacy and tranquil atmosphere. 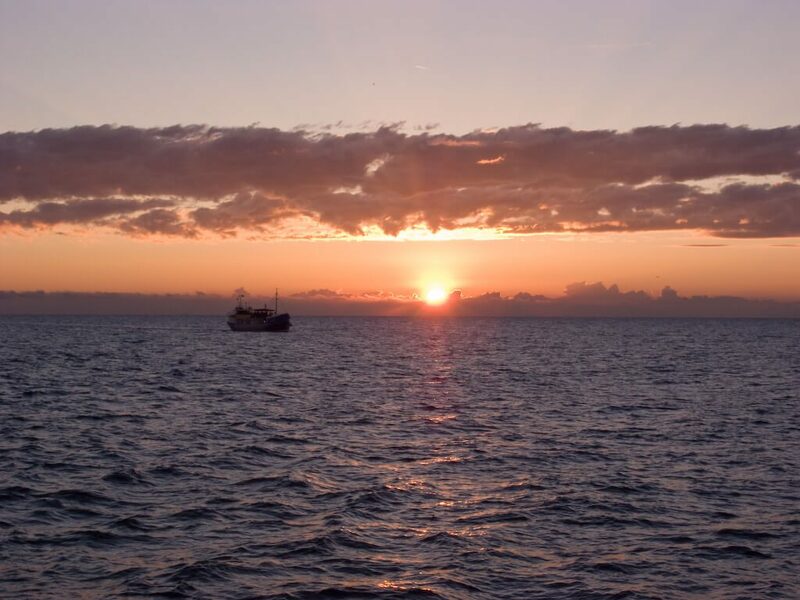 Izola is a small seaside fishing town with a 5-kilometer long coast and eight different beaches. 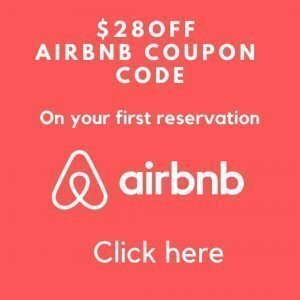 It is a good choice for those looking to escape from massive tourism and so more appropriate for families and the elderly. It features a coastal walk, bathing areas with facilities, natural and wild beaches, an archaeological site, an extensive marina, restaurants, and cafes along the waterfront. This is also an amazing place with the best view of the sunsets. Moreover, it is a wheelchair accessible beach and even a dog-friendly beach. The most popular beach in Izola is Simonov zaliv bay or San Simon with sandy areas, featuring a beach volley court, the last waterslide on the Slovenian coast and a multi-purpose sports court. It is mainly visited by youth and families with children. Delfinček beach is popular among guests of the Delfin Hotel, seniors and families. On this partially concrete beach, you can rent sunshade and sun-lounger. Another well-visited beach is also Svetilnik or the Lighthouse beach, popular among windsurfers and kitesurfers. The beach features a restaurant, a bar and a playground with a sunshade and sun-lounger possibility of renting. At the very end of a narrow peninsula is located Piran, a medieval and most preserved Mediterranean town, with its architecture, strongly influenced by Venice. This charming town features narrow alleys, its heart is Tartini Square with Venetian house and Tartini House, the fortification around town, St. George’s Cathedral from the 17th-century, a harbor full of boats. Piran’s beaches are rocky areas and paved in concrete. Fiesa beach is a small, peaceful bay, well visited by locals and surrounded by nature, just next to the town of Piran. The water is shallow, thus appropriate for children. The beach is also popular among diving and snorkeling lovers. Between Izola and Piran is settled a nature park, named Strunjan nature park, charming for its typical flora and fauna. Strunjan is less developed and less touristy but at the same time perfect for those who wish for a calm and peaceful holiday with unspoiled nature. The beach is of rocks and sand, tranquil waters, and easy access. The flysch coastline of Strunjan affords a gorgeous view of the entire Slovenian coast and if it is beautiful weather also Gulf of Trieste and all the way to magnificent mountains, The Alps. Such a magical place! Under the steep cliff of Strunjan, you can find lovely beaches, the one you can’t miss is Mesečev zaliv (Moon Bay beach). It is also called Zaliv sv. Križa (bay of St. Cross) due to the large white cross standing on top of the cliff overlooking the beach. This pebble beach can only be accessed on foot – from Strunjan parking, walk through the hill and down the cliff. There is also another beach, called Salinera beach (owned by Salinera Resort), surrounded with lush Mediterranean vegetation and pine trees. It is said that here are located 12 energy points which have a positive impact on general well-being. 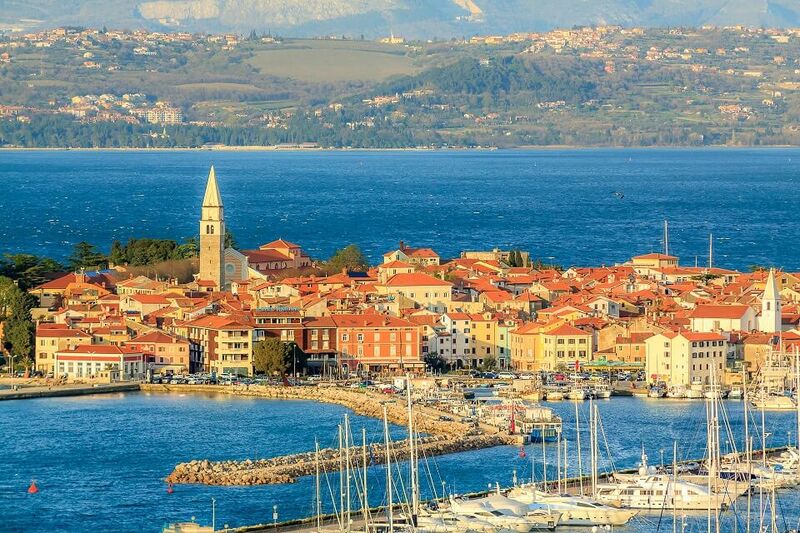 Koper, the biggest city on the Slovenian coast, situated on the border with Italy. It features a medieval old town center, old churches, palaces and square with historic Venetian style, but also urban style, modern promenades, the marina, and beaches. The beaches in Slovenia are small and pebble, many times crowded during peak season, therefore I suggest you choose the beaches described above this post. 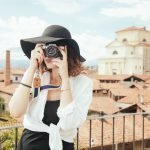 This is our Slovenia travel blog! These articles are all related to Slovenia, one country we love and is very special for us. 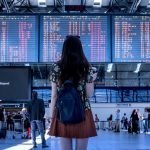 Backpacking in Slovenia is great option! Follow this itinerary across Slovenia by reading the following posts. Slovenia has a lot to offer and some say that is the most underrated country in Europe. But the tourism is growing attracted by places like The Lake Bled or Postojna Caves. In Slovenia you can feel the nature very near from you, as the country has around 50 % of its are covered by forests. You will find in our articles tips for traveling that will help you to plan your next vacation in Slovenia. 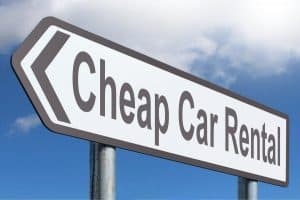 Why rent a car in Ljubljana? Renting a car in Ljubljana is a great way to fully explore the city. Obviously with a car you have the freedom to go where you want and when you want! In Ljubljana there is a great bus transport system that works with a card called “urbana”. But unfortunately the bus doesn’t go so often and sometimes is full of people. The same applies to the whole country. 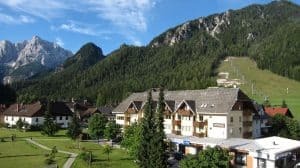 From Ljubljana you can go with train or bus to many touristic places like Bled or Maribor but other idyllic places in Slovenia are not reachable in an easy way with the public transport, for example Kranjska Gora, Goriska Brda, Lipica or Logarska Dolina. In addition, with a car you can easily enjoy the slovenian beaches or explore other wonderful places in this country. How much your Ljubljana car rental costs will depend on the type of car you rent, the insurances you choose to get and time of year you are visiting. Slovenia is a country where people care about having things in order. The quality of services are no exception when we talk about the routes and highways in Slovenia. It is very hard to find a route or street that is in bad condition. On the opposite, you will drive and enjoy your ride in one of the most beautiful countries in Europe. Slovenia uses a driving pass system called vignette. This is a sticker you must buy and use while driving on highways. It should be sticked in your windshield to avoid fines. If you rent a car in Slovenia it is very probable that it already has the vignette. If you want to buy one you can do it at a gas petrol station. Searching for a different getaway, maybe looking for a special anniversary celebration or honeymoon? Experiencing adventure in nature without giving up all the luxuries for your stay? Glamping in lake Bled Slovenia make it possible. Keep on reading, you will see what this magical place has to offer. Glamping is a way of connecting nature with luxury, a fantastic experience where you have resort-style services on a non-traditional tent. A perfect fusion between glamour and camping that doesn’t sacrifice comfort. 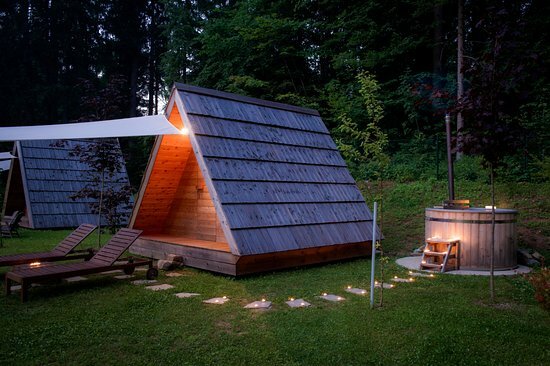 By experiencing glamping near Lake Bled ( just 1.5 hours from Ljubljana), Slovenia you will forget about daily routine. Why choosing Bled? Because it is an idyllic location that will make you stunned. 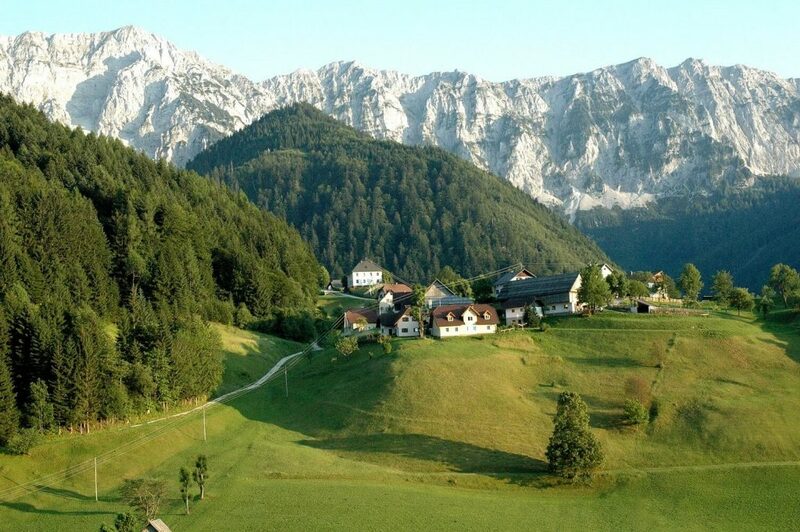 Glamping houses described below are nestled in a gorgeous area of town Bled and next to the Triglav National Park, where you can explore Slovenia’s highest peak. This location offers many possibilities for active holidays. From hiking, cycling, playing tennis to summer water sport and winter sports or discovering surroundings, such as Bled Island and its castle. 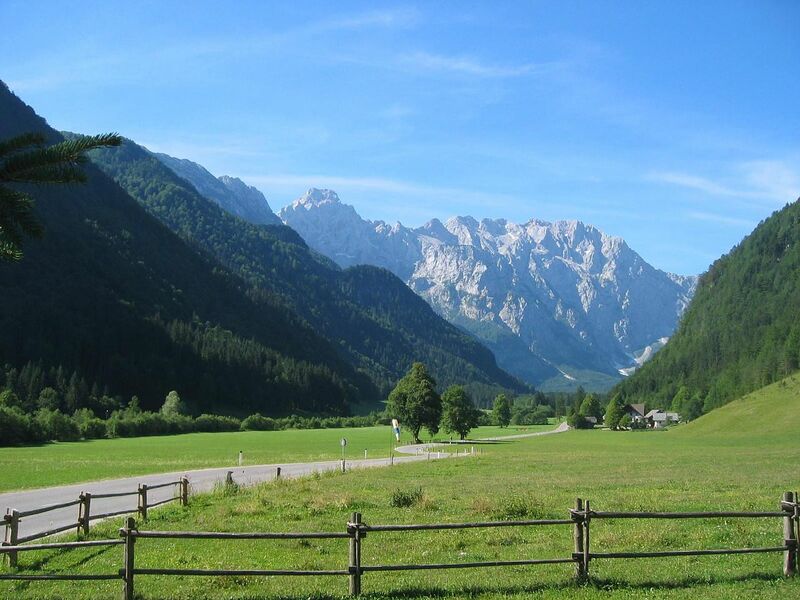 Another option is to participate in excursions or explore most attractive places in Slovenia. 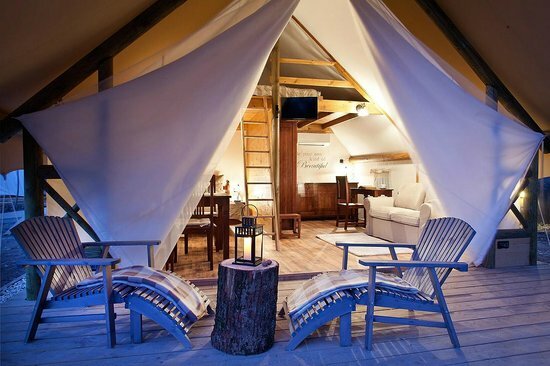 If you are not familiar with the term “glamping”, let us break it down for you. In short, this is a modern or luxury trend of camping, which combines the simplicity of camping with a modern amenities of a hotel. Garden Village Bled, Slovenia is definitely a choice you will not regret. It is only 100 m from Lake Bled. In this Glamping, you can choose different type of accommodation: Tree Houses, Pier Tents, Glamping Tents or Studio Apartment. None of these accommodations allow pets in the resort. Tree Houses are really divine where you will experience truly fairytale or make your childhood dreams come true. 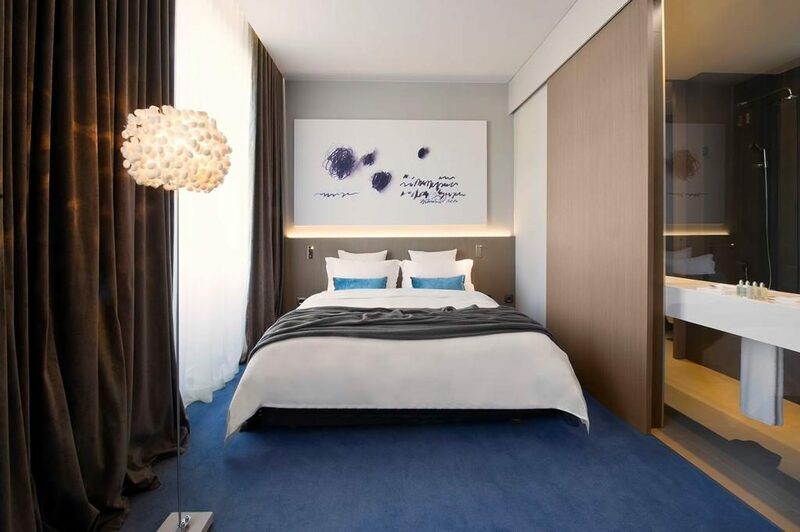 The exterior of the property is simple, but interior is stylish, designed for all the relax and comfort you need. Each tree house is equipped with two double beds, a kitchenette, a minibar, TV, a bathroom with shower and a table. There is also a liftable staircase which offers more privacy. Each property can accommodate four people. 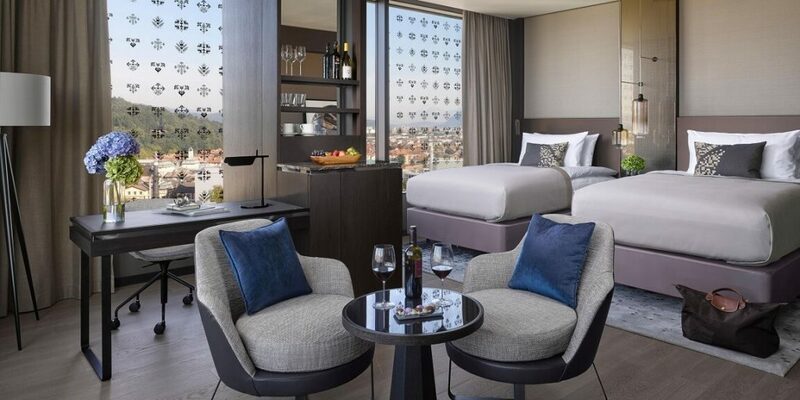 There is also a balcony with chairs where you can enjoy morning coffee or a cup of wine at night with your loved one. The tree houses are connected by wooden bridges. 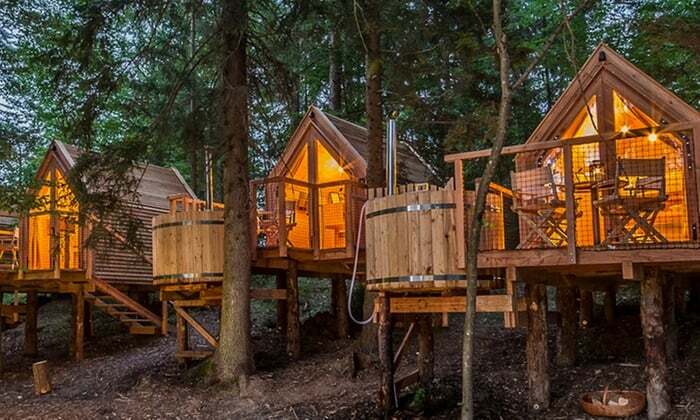 These magical tree houses offer you unforgettable and unique experience. If you prefer more simple and romantic accommodation for two, pamper yourself and loved one with Pier Tent. The tent is furnished with a double bed, a mini fridge and a chest for your luggage. Bathrooms are located in a wooden lodge next to the tents. Outside a tent is a table with two chairs. For those more oriented to nature, camping and lux at the same time, here is Glamping Tent equipped for 4 people. You will be assured of more privacy due to bushes and trees. Each of Glamping Tent includes 2 bedrooms (a double bed and two beds), a bathroom with shower (by your choice also possible to open a glass roof), a sofa, a minibar, a TV, air conditioning, a dining table, chairs outside a tent and outdoor hot wooden tub for evening relaxation. No worries if you choose to come in colder months as each Glamping Tent is provided also with floor heating system. Your children will enjoy this place as a Glamping Tent is surrounded by a garden and its crops and offers enough space for playing. Restaurant Vrtnarija: here you will enjoy top-quality local and seasonal food with fruit and vegetable from their garden. 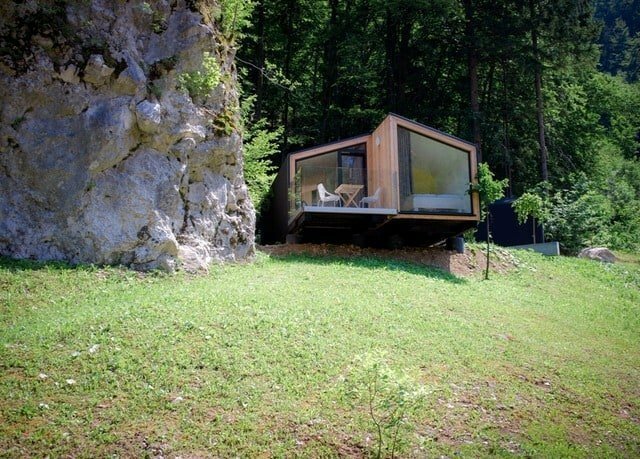 Another Glamping near Lake Bled, Slovenia is Glamping Ribno, located only 3 km away from the Bled Island. The accommodation is furnished with a double bunk and two closets. There is also a table and two armchairs and two tabourets. All houses are equipped with cable Tv and Wi-Fi and both indoor and outdoor lighting. Each house can accommodate four people. 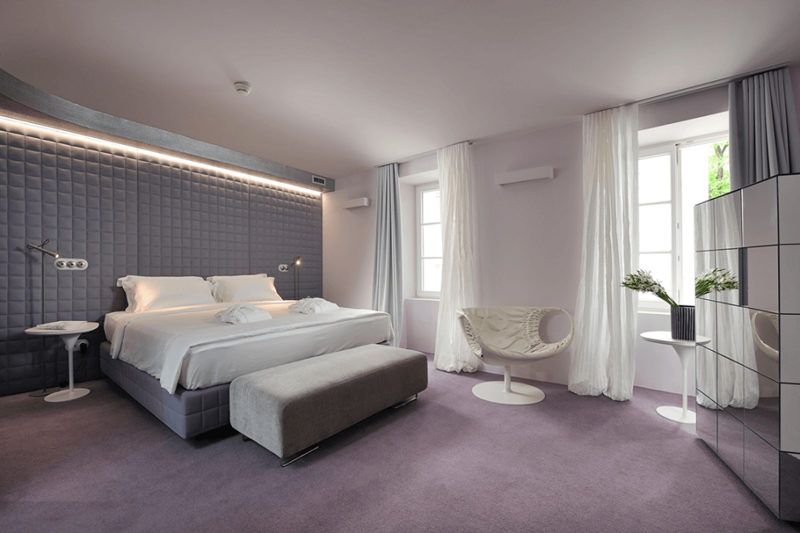 Since it is equipped with heating, it is suitable for stay throughout all the year. On the terrace of each tree house, there is a table with four folding chairs and a wooden hot tub with a lid. Each accommodation unit offers an external private bathroom with a shower, toilet and sink. There are some communal areas in which you will enjoy, such as sauna with a shower (extra pay), toilet and space for resting. You will also enjoy in a separate resting area with sun loungers. Located right next to the Lake Bled in a remote campsite and surrounded by beautiful landscape. This is a perfect retreat for a couple. The hut is simple yet stylish, made from organically grown wood. 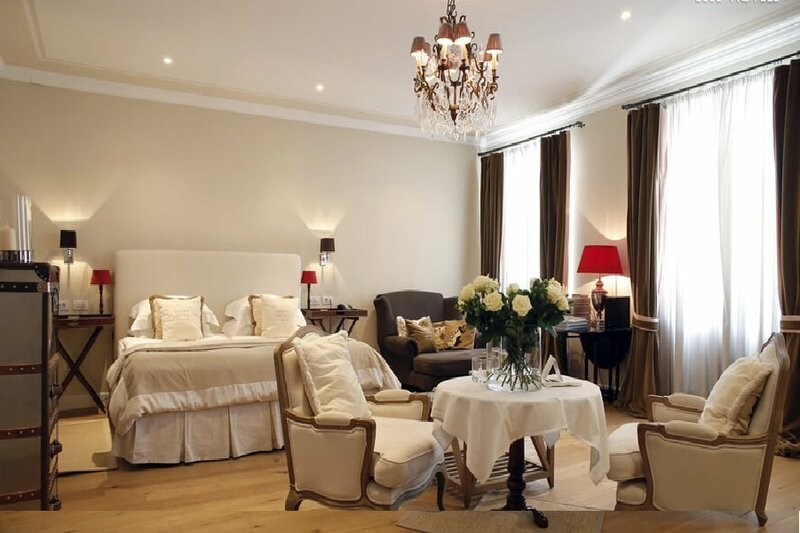 The accommodation includes two bed or a double bed. In front of the hut, there are two lounge chairs and a wooden table so you can relax in the beautiful surroundings. For making your stay more comfortable and relaxing, there is a wooden outdoor bathtub heated by firewood. There are also private bathrooms for rent. If you want to escape into a wilderness with your family is Family Glamping near Bled perfect location. Situated in the same camp as Gozdne vile Glamping, at the edge of the forest. It offers beautiful views and complete privacy. What makes this glamping different from others are large windows that give you a feeling of more connection with surrounding nature. During summer months there are plenty of shadows due to greenery. Glamping house features a separate bedroom, a living area, a kitchen, a bathroom and a bunk bed for children. 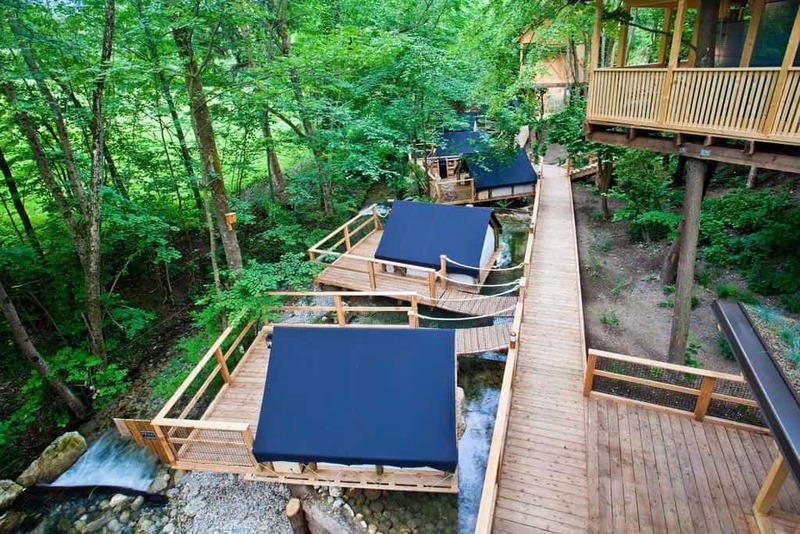 For your next forest getaway, look for any of above-mentioned Glamping near Lake Bled. When I think about Slovenia, doesn’t come to my mind only outstanding landscapes but also the best Wellness Centers and Slovenian Spas. 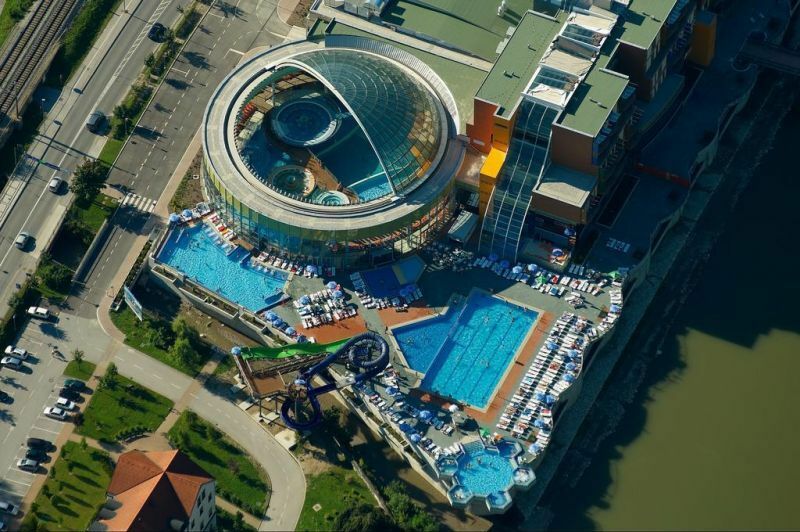 With the abundant and diverse selection of thermal spas in Slovenia you will find everything you need. In the following, I prepared a list of the best Slovenian spas you would like to visit. No matter if your reasons are health, relaxation or fun, here you will definitely find something for yourself and your loved ones. Not only that, you can enjoy indoor and outdoor pools, with a workout for all ages, water massages, waterfalls. the pools are provided also for children. Other indoor activities are aerobics, organized workouts with the help of physiotherapist and fitness workouts. Another option includes outdoor activities, such as cycling, organized hikes, playing golf, Nordic walking, tennis. Perfect spot for relaxation and environment with thermal indoor and outdoor pools and numerous water attractions. Regardless of a season, all the attractions and pools are adapted to it. In winter, The largest indoor pool offers whirlpools, slides, toboggan, and other water adventures. In summer, the outdoor pool, Formula Race and Pirate’s island is especially interesting for the youngest. Here are also organized many animation programmes for all generations: pilates, gym, eco workshops, aqua fitness, etc.. 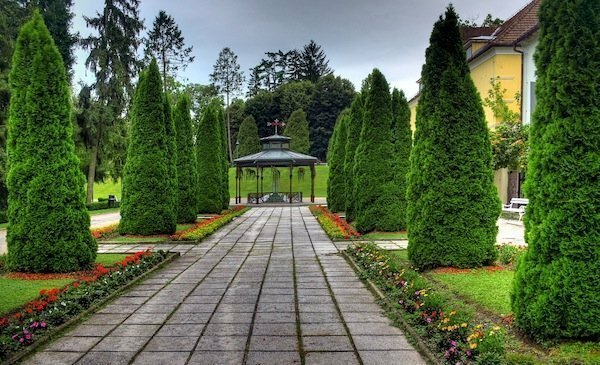 Located in a peaceful park, in the town of Laško, about 10 kilometers from Celje. Thermal spring water at Laško is demonstrated to have healing effects, thus it is used as the main healing factor the programmes of Medical Rehabilitation. Laško Thermal spa resort services include: Ayurveda treatment, pools, saunas, medical center, various therapies, Department of rehabilitative care, wellness programs. Beer wellness pampering is definitely the one you need to try as you can experience only here. Terme Zreče spa is located in the green environment of the Pohorje mountains. Perfect spot not only for relaxing in many facilities it is offered in Zreče spa but also as active holidays. Rogla ski resort is a popular destination only half an hour from Terme Zreče spa, where you have countless possibilities to enjoy in nature – hiking, walking, skiing in winter, cycling. 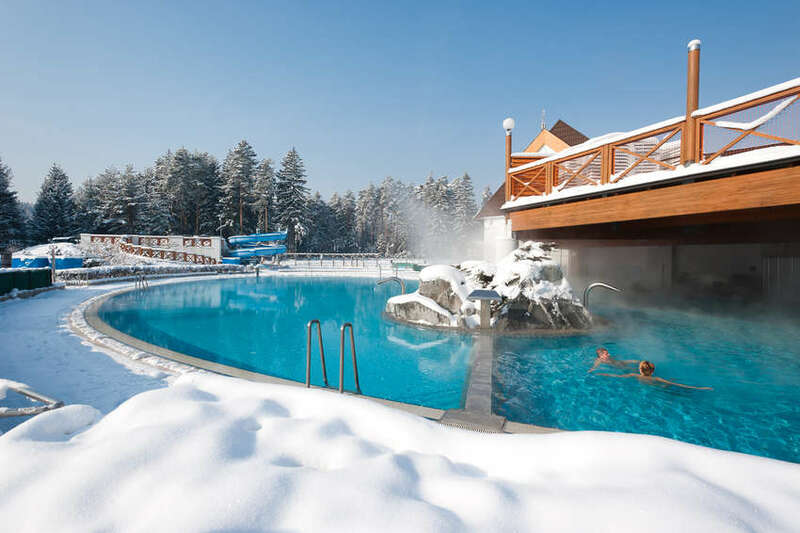 Terme Zreče spa offers natural healing such as mountain peat from Pohorje woods, volcanic mud – fango, thermal water with high calcium and mountain climate. Facilities they provide: indoor and outdoor swimming pools, a sauna village (with Pohorje herbs), fitness, Idyla wellness and spa center. Located in Prekmurje region, in north-east Slovenia, Slovenia’s most famous thermal destination. The black thermal mineral water, also called “black gold” has many beneficial effects on health and beauty but is not appropriate for consumption. “Black gold” was discovered by accident in 1960. Highlights include spa and relaxation programs, medical and wellness center, 28 pools, Thermal park, Livada golf course. There are also offers for cycling tours, Nordic walking and football pitch. 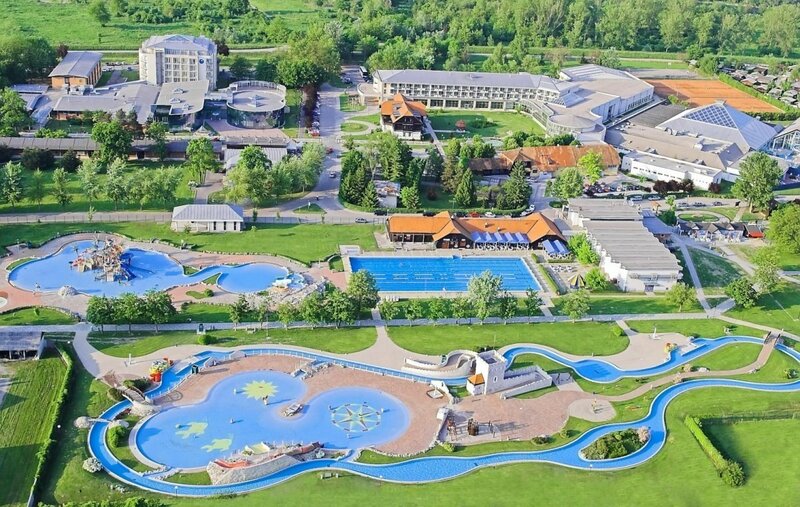 Terme Topolšica spa is located in the northern part of Slovenia, about 10 km from Velenje town. This spot is definitely awesome as it offers a natural environment, peacefulness, subalpine climate, plenty of sunny days and a hot thermal water appeared from the earth. The facilities include Wellness center Zala (saunas, Medico wellness, massages), fitness center, indoor pool, outdoor Water park Zora. Situated between forests and grass, in Dolenjska region. Terme Šmarješke Toplice spa was the first one in Slovenia to offer medical wellness programmes for preventing cardiovascular diseases, diabetes, obesity and metabolic disorders. Other facilities include Vitarium spa wellness center, thermal pools, saunas, yoga, Pilates, fitness, training programmes and testing, massages and relaxing herbal baths. In the vicinity of the hotel is a sport park, where you can enjoy playing basketball, volleyball, football, tennis and golf. Climbing journey at the Otočec Adventure Park is another option you can choose and is only 4 kilometers away. Take advantage of peaceful green surroundings and have some active days in nature like cycling, hiking, Nordic walking. The Terme Olimia spa is located in Podčetrtek, in the east of Slovenia. 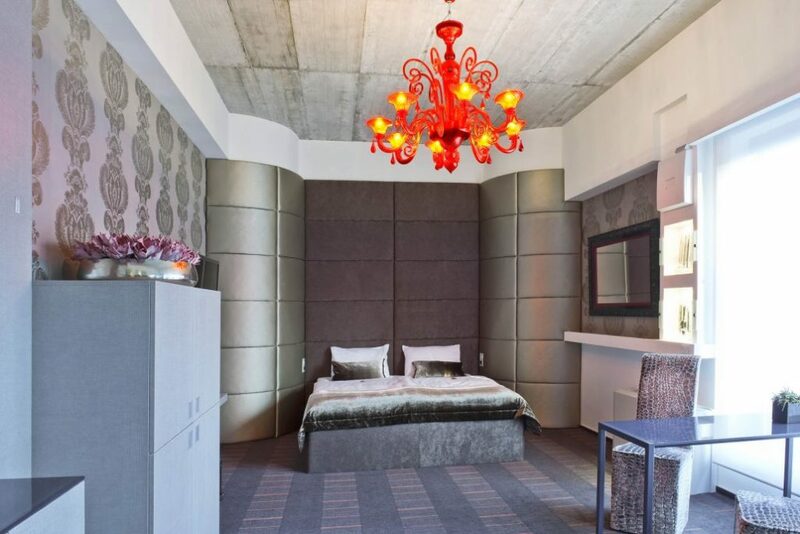 This resort is one of the most modern and luxurious thermal spas in Slovenia. 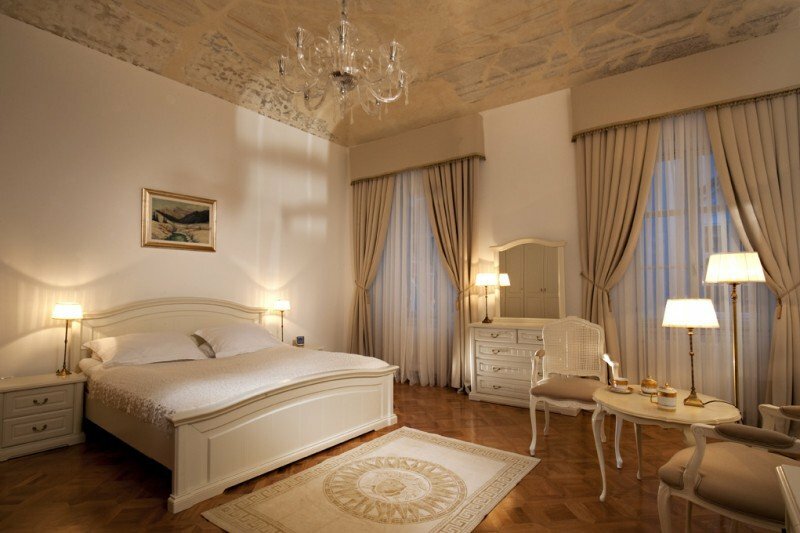 It was rated as the best spa and wellness center in Slovenia. 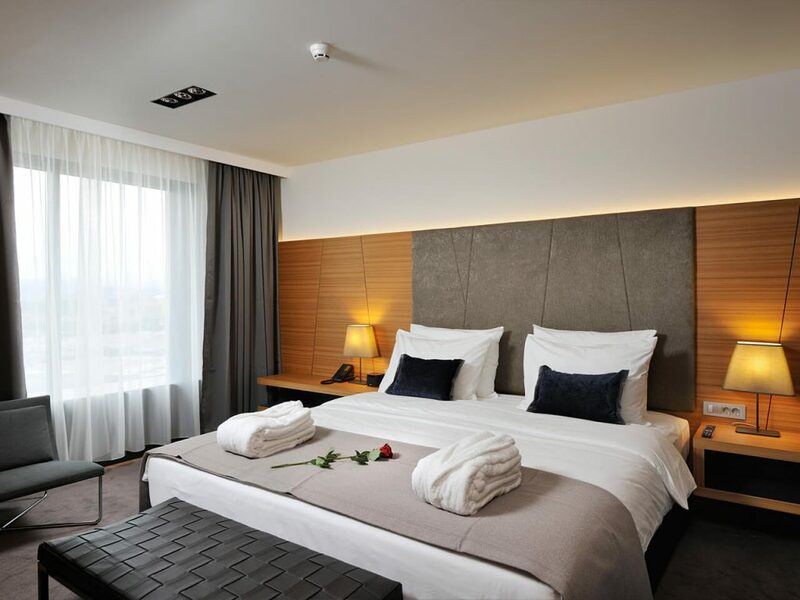 This resort offers a variety of facilities: hotels, holiday village, Wellness Orhidelia – the most prestigious part of Terme Olimia, the largest sauna world in Slovenia, beauty centers, pools, fitness center, a health center, restaurants and more. 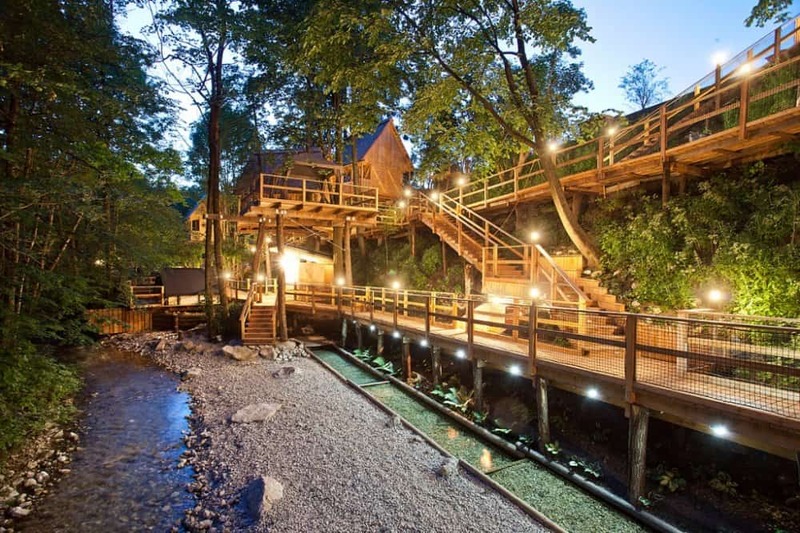 This is definitely one of the best Slovenian spas worth visiting. Lifeclass spa and Wellness Portorož is located in the small city of Portorož, on the Slovenian coast. With more than 110 year of tradition has a long traditional as a natural spa. The main offer contains all the attributes of local origin such as Sečovlje salt-pans, the sea, Mediterranean climate, mud fango, brine – Aqua Madre, thermo-mineral water. The highlights are Medical center and center for Aesthetics and anti-aging, beauty center, Wai Tai center, Shakti – Ayurveda center, swimming pools (with sea water and Prehistoric sea), Talasso center, 7 types of saunas, fitness center and group exercises. Your kids will love this place too, as the offer is provided also for the youngest. They will choose between Mini club, Children’s wellness and playground. Another option is an active holiday, the coast offers limitless possibilities for cycling, hiking or Nordic walking. 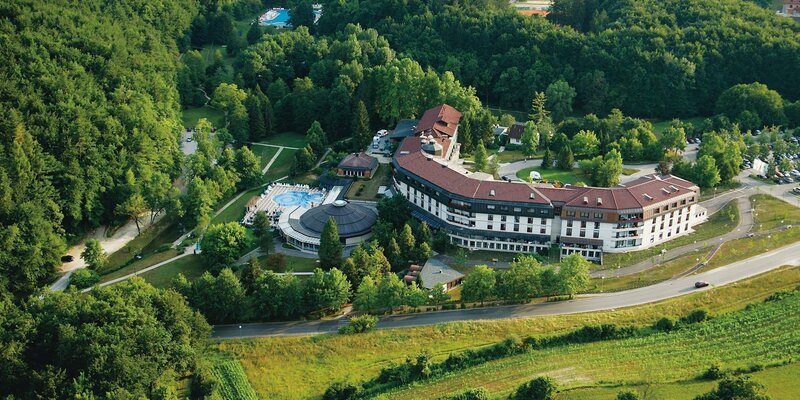 The Rogaška Slatina health resort, with its 400-year tradition, is Slovenian oldest and best known thermal resort. It is located in eastern Slovenia. Rogaška Slatina resort is well known for its magnesium source – Donat Mg water, which helps in overall health. Facilities include Balneotherapy, Donat MG drinking water therapy, beauty treatments, different types of massages, health education, dietotherapy, surgery, and physiotherapy. It is worth to mention that to get to these thermal spas in Slovenia cannot be easy because public transport is limited. 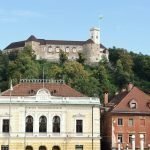 I have written a guide about car renting in Ljubljana ( or Slovenia) that can help you with driving in this country. Hope we helped you choose the most appropriate Thermal Spa in Slovenia to suit your needs and plan your next holidays. There are endless opportunities of amusement in this beautiful country of central Europe. Currently there is one “Train Spa” offered by the national train services that provides a good alternative to reach some of these famous spas. More info here. Have you ever been thinking about visiting Slovenia? What if you choose this destination to be your next stop? Here I present you a list of 9 best places to visit in Slovenia. If you don’t know anything about this country, I bet you are going to fall in love with this place and will not regret visiting it. Here are some tips about which places you should visit in Slovenia. Keep on reading. Firstly, let me introduce you this gorgeous country. Slovenia is a country situated in the heart of Europe, between the Alps and the Mediterranean Sea. Slovenia is the third most forest-covered country in Europe. It’s not needed to mention that all your senses will enjoy the nature and fresh air. Welcome to a first country declared as a green destination! Despite the small size of this country, intact nature, charming old towns, romantic scenery, sparkling waterfalls and lakes, Slovenia will leave you speechless. Has Slovenia quickened your curiosity? Well, below you will find some best places I propose you to visit in Slovenia. 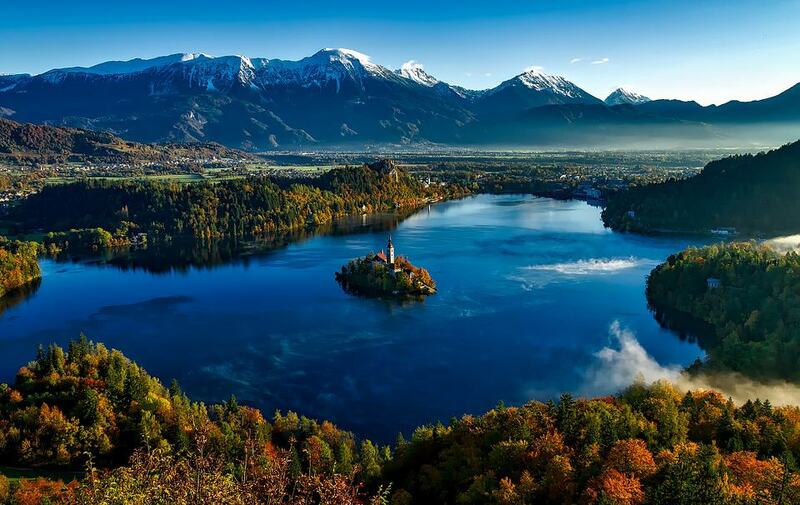 Lake Bled is one of the most visited attractions in Slovenia and a must-see place when you visit Slovenia. Usually, it is enough a day or one-afternoon spending in Lake Bled. You will be impressed by its natural beauty, lake, island, and surroundings. Wooden boats will take you experience the beauty of this lake and will take you to the island. There you will visit the old church, ring the bell yourself and your wish will come true like the legend says. The best way to enjoy the view of the Lake Bled, its island and surroundings is from the Bled Castle. 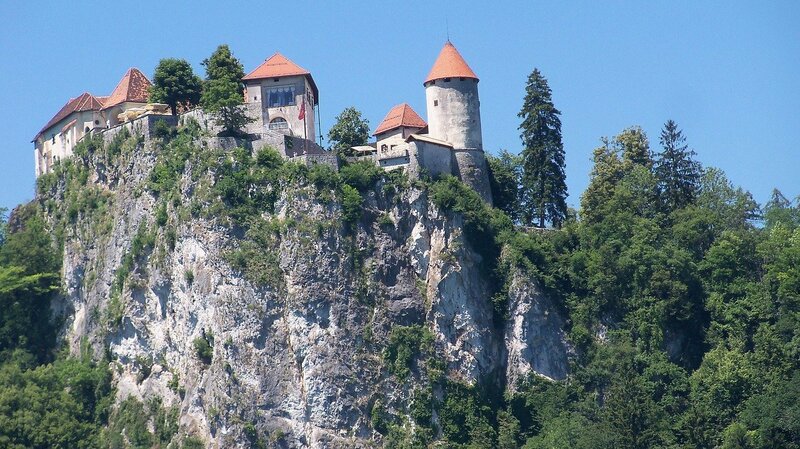 To learn more about the Castle Bled and why to visit it, check it here. 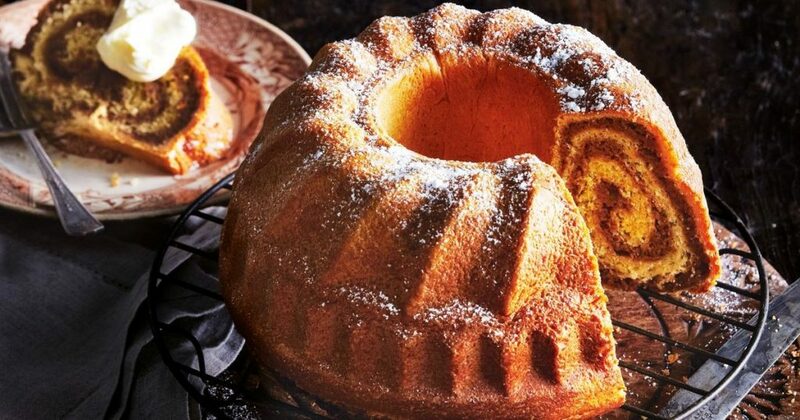 When you will be there don’t miss famous dessert – The Bled Cream cake (or “Kremšnita”). The majestical view, pure air and surroundings make this place to be in the 1st position of best places to see in Slovenia. The old town of Piran is the most beautiful and touristic town of Mediterranean Slovenia. This picturesque town thrived thanks to salt pans and developed under the influence of Venice. Read our guide about Slovenia beaches in order to find out more about the Slovenian seaside. You will enjoy walking on narrow streets, admiring the medieval architecture, its church, and the central square. This town offers you the Maritime Museum, an aquarium, as well cultural events. Here you will find many seafood restaurants. The Soča Valley represents one of the pearls of this green country. Named after The Soča River and considered one of the most beautiful Alpine waters in Europe. The river is known as “emerald”, because of its green color. 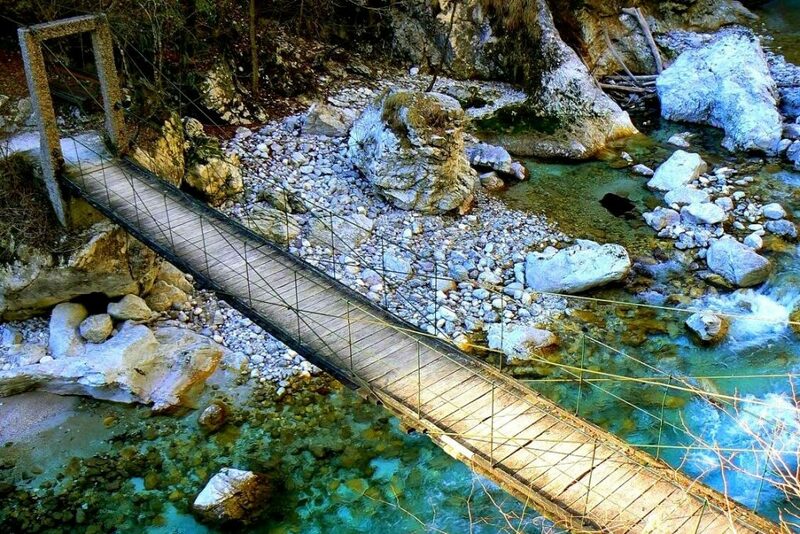 The Soča Valley is well known for its sports activities, natural and cultural heritage. 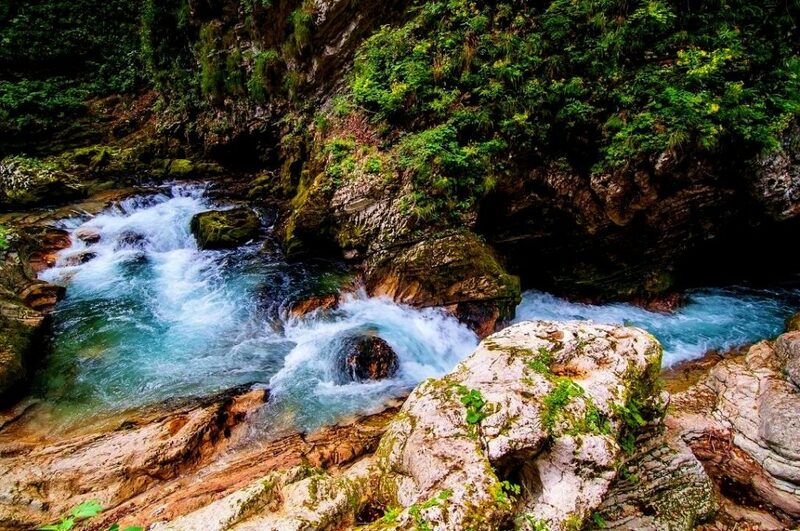 Soča River is a spectacular place for nature lovers. You can enjoy short walks by the river, fishing, or adventurous sport activities, like kayaking, canyoning, rafting, etc. The Logar Valley is considered to be one of the most beautiful Alpine valleys in Europe. Here you will be captivated by untouched green nature at every step. If you are seeking memorable experiences, active holiday or relaxing in this gorgeous landscape, alone or with your family, this is a perfect place to go. You can choose between hiking, cycling, horse riding or walking around and let your body, mind, and soul relax. The valley is known also for waterfalls, endangered flower species. Here you will explore delicious local food and cuisine. Apart from admiring green spaces and enjoying in the fresh air, Slovenia offers much more than that. 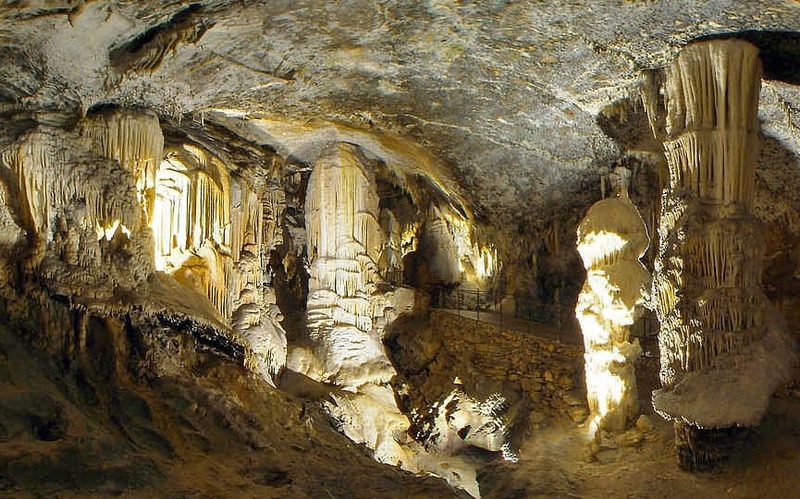 Another attraction that is popular among tourists while visiting Slovenia is The Postojna Cave. It is the most tourist cave in Europe with unusual sculptures and animals. A tourist train will take you to the underground of tunnels, halls, and galleries. There you will admire stalagmites, stalactites and some other features created by water. You will be able to see the most famous underground animal, called the human fish (olm). During an hour and a half long guided tour you will learn also a lot about endangered species. The ticket starts from something more than 25 EUR. Lipica is another main tourist attraction of Slovenia, more known for Lipica Stud Farm, which is the oldest in Europe. This place is the origin of the Lipizzan horse. You will marvel horses while watching the riding training and their shows. A guided tour will tell you more about these elegant Lipizzan horses. Goriška Brda is often referred to “Tuscany of Slovenia” because of its similarity of the landscape. It is a stunning wine region, rolling hills with vineyards, orchards, and some charming villages. There is a number of options for cycling or walking around there. You can treat yourself to flavors of local Mediterranean food in a restaurant and do not forget to taste a glass of a quality local wine. Goriška Brda is not only known for its big wine production, worldwide known quality wine, but also of many cultural highlights. Here you can visit a tower, castle, monument of the victims of the second world war, and cultural events and festivals. 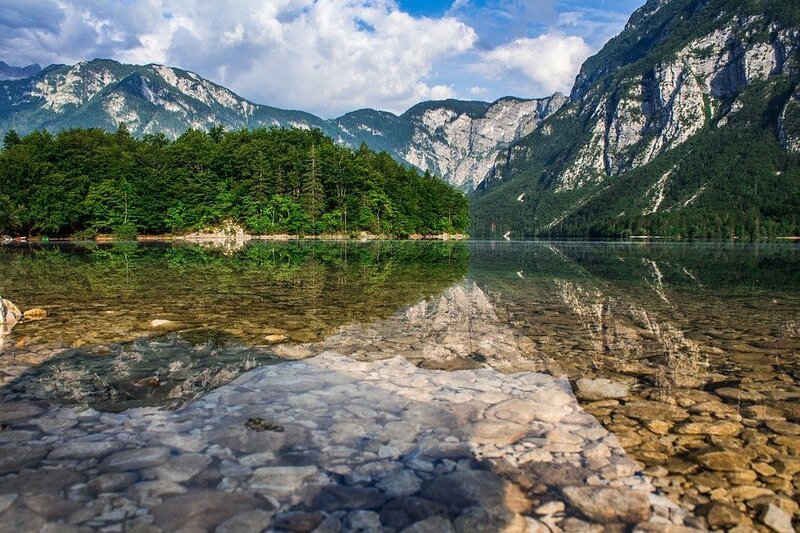 Lake Bohinj is the largest natural lake in Slovenia, located in the Bohinj Valley, which is part of Triglav National Park. 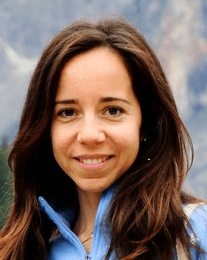 Lake Bohinj offers many outdoor activities. Lake Bohinj is perfect for swimming, kayaking, boat riding, windsurfing, fishing and sometimes even ice skating or just do some walks around the lake. Lake Bohinj is much less crowded than Lake Bled, more natural, and only 30 minutes ride from Lake Bled. The view is stunning and definitely worth taking some photos. The entrance is charged 3 EUR per person. 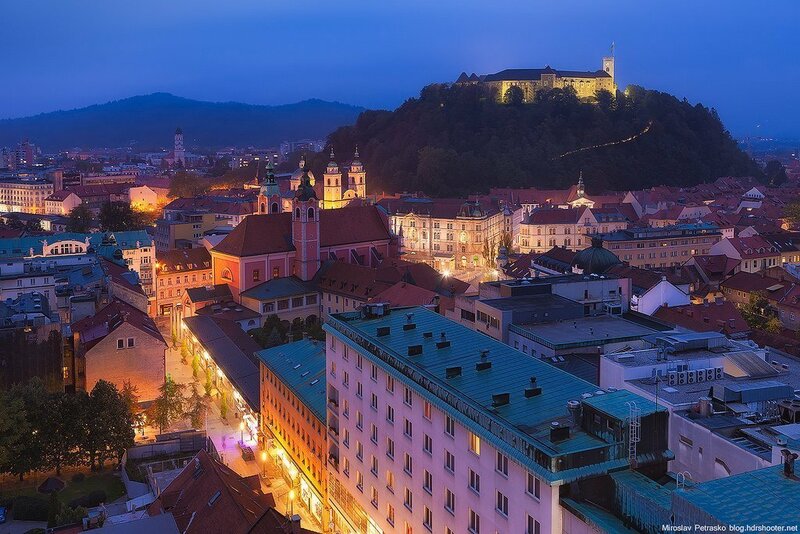 Ljubljana, the capital Slovenia, is the most populated city with around 300.000 inhabitants. It is full of cultural events during all the year and definitily worth visiting its museum and parks. We have written a full guide about places to visit in Slovenia in this guide. Discover these beautiful places and create the best memories of your holidays. These were the 9 Best places to visit in Slovenia. This wonderful country is waiting for you. 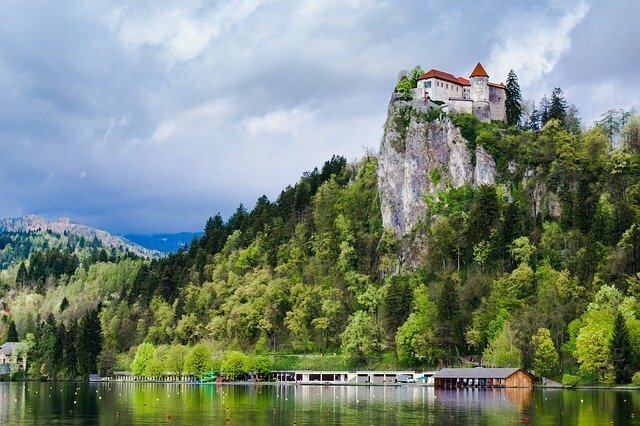 Majority of tourists who visit Slovenia explore the Lake Bled Castle. It is the Slovenian main tourist attraction. Not only that, it’s a symbol of Slovenia and of the Lake Bled as well. 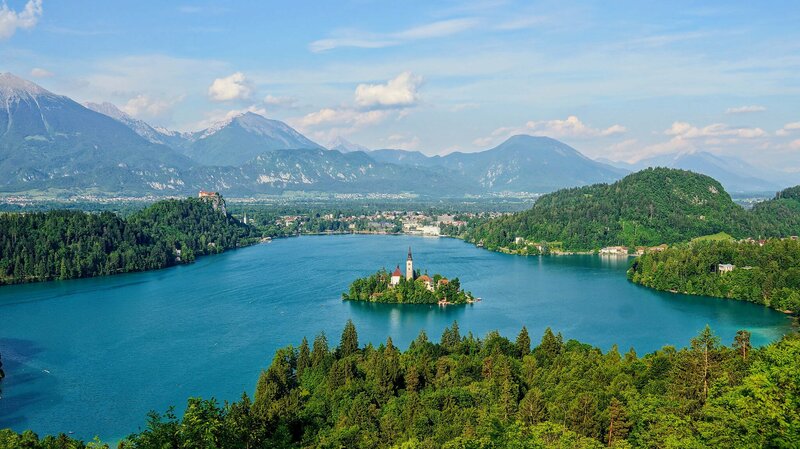 Its magnificent surrounding nature and history are the main reasons why Lake Bled is so popular. If you are in Bled, here are some reasons you don’t want to miss visiting the Lake Bled Castle. Bled castle is the oldest castle in Slovenia with more than 1000 years. Some parts of the castle are in Gothic, Renaissance and Romanesque styles. The castle is now arranged as an exhibition area. How to get to the Lake and Castle? It’s only 1 hour away from the capital, Ljubljana. You can reach it from any city by car, train or bus. Once you are in the lake you will see a path and then stairs that go above the hill till the castle. Million dollar view – Bled castle stands on the cliff, 130 meters above the glacial Lake Bled. In the background, you can admire the Julian Alps. Some say it is the best part of the Lake Bled attraction. And if you are not interested in historical buildings, like this castle is, it’s worth seeing the view. Take enough time here to enjoy the view of the Lake, its island and the town Bled. A chance to get some good panorama shots, so if you can, choose the day to visit the castle when the day is beautiful. Walking up to the castle from the lake will take you about 15 minutes. But take care, because of steep steps that lead to the castle, especially in winter when there is snow or wet weather. If you have difficulty climbing, the castle can be reached by bus and car as well (there’s a parking at the top). One of the most visited historic and cultural attractions in Slovenia. It is a popular attraction even during the off-peak season. If you want to avoid crowds, go early in the morning. The museum Bled Castle offers an eventful history of Bled from the time when the first settlements in the area appeared to the present day. From Bled you can visit the also famous Vintar Gorge where you can make an awesome hiking trip and have a wonderful view from lake bled and surroundings. Bled castle contains also a Wine cellar where you can taste its top quality wines and see a demonstration of bottling of wine. In the restaurant of the castle, you can enjoy Slovenian traditional dishes and drinks. Castle printing works is another spot you can visit in the castle Bled. You will be demonstrated of printing on a printing machine. The castle’s forge represents the heritage of the past as a form of art. Here you have a chance to make your own souvenir coin on an anvil. The castle Bled hosts many cultural events. This is definitely one of the most fairy-tale and romantic venues for newlyweds.